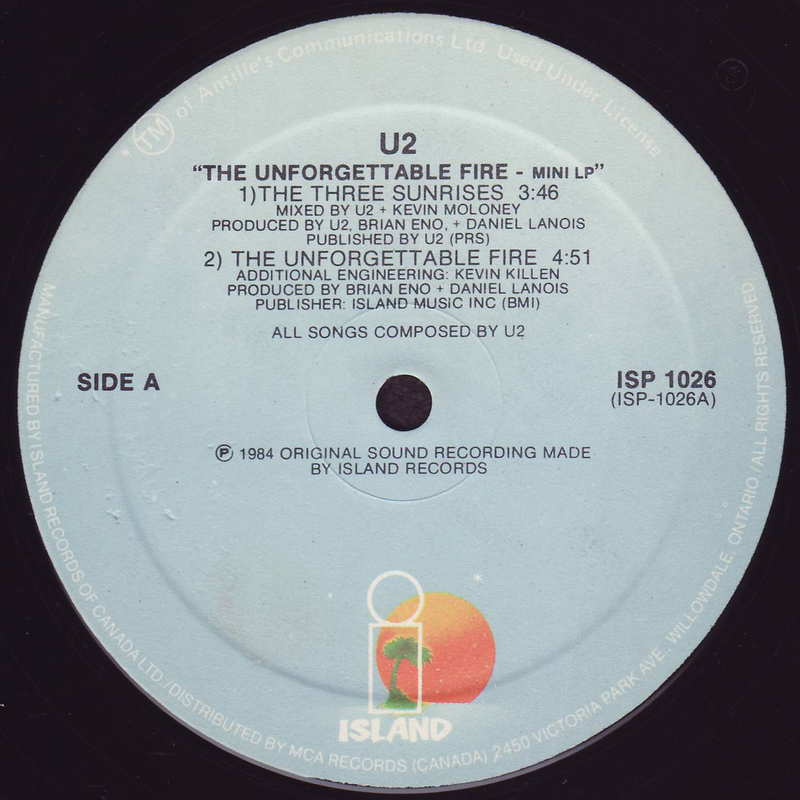 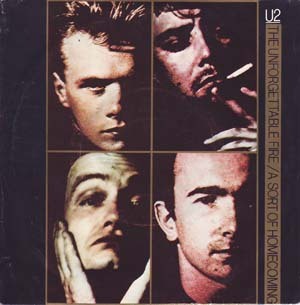 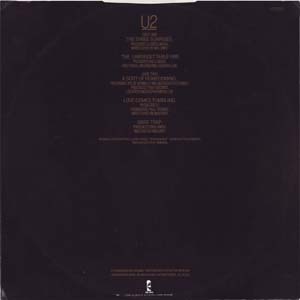 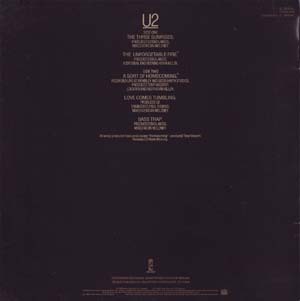 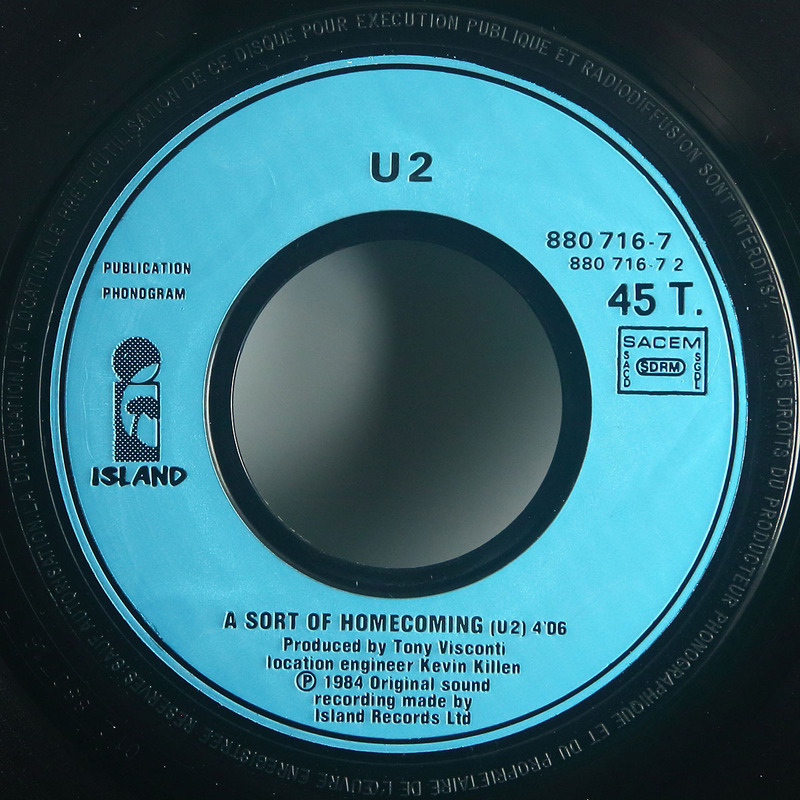 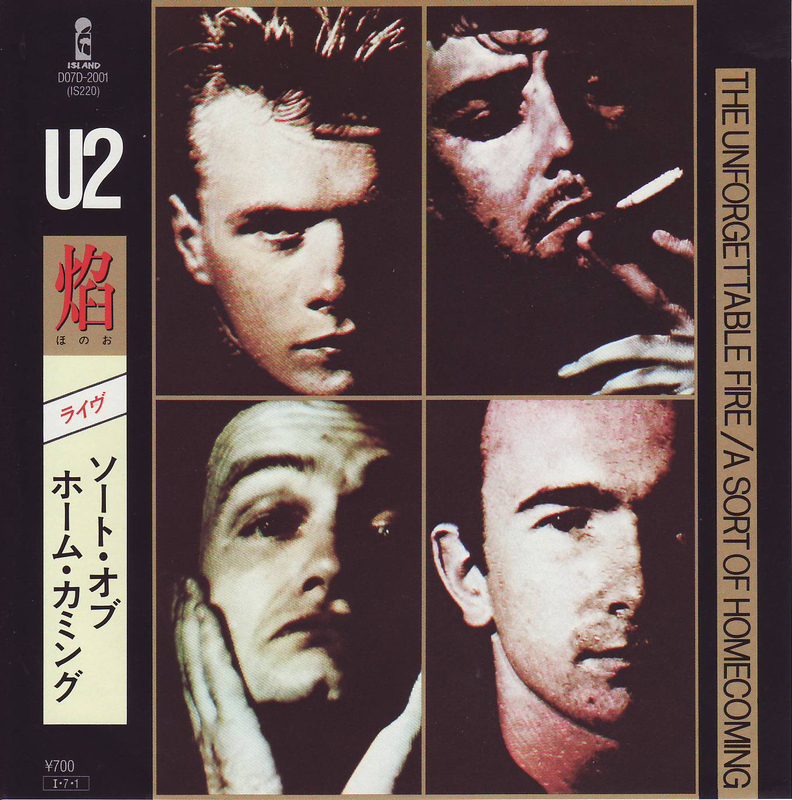 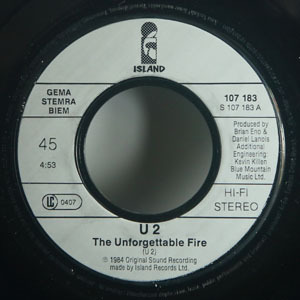 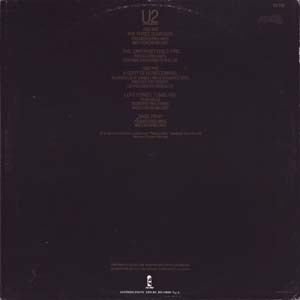 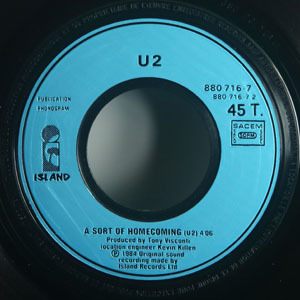 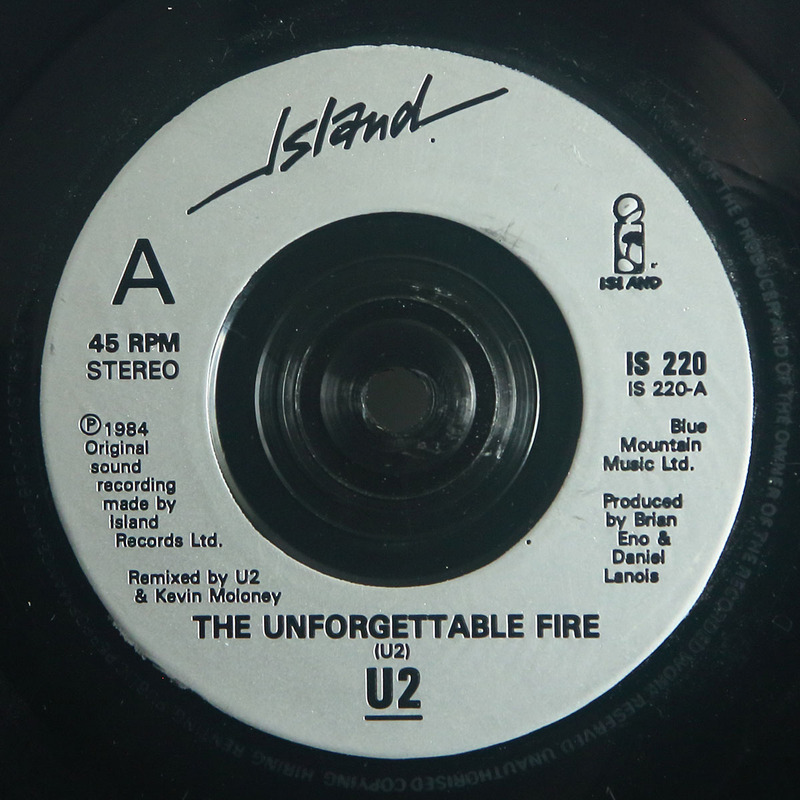 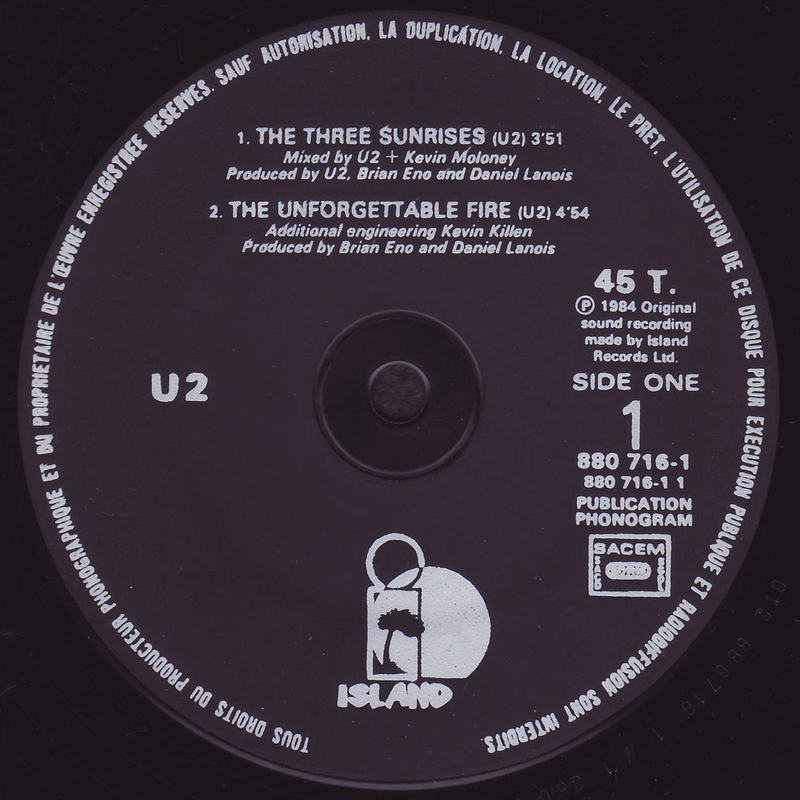 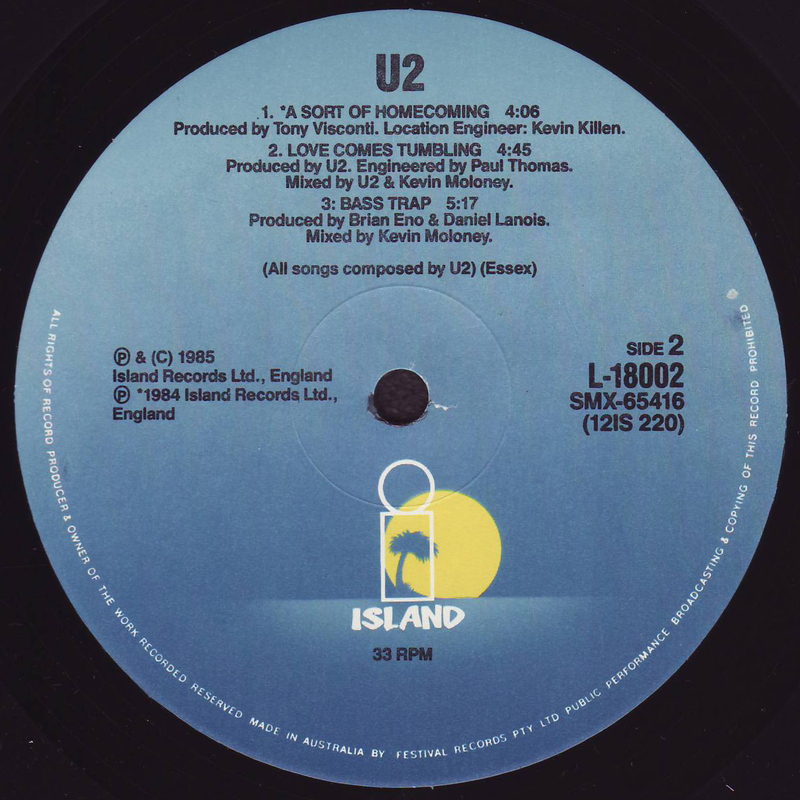 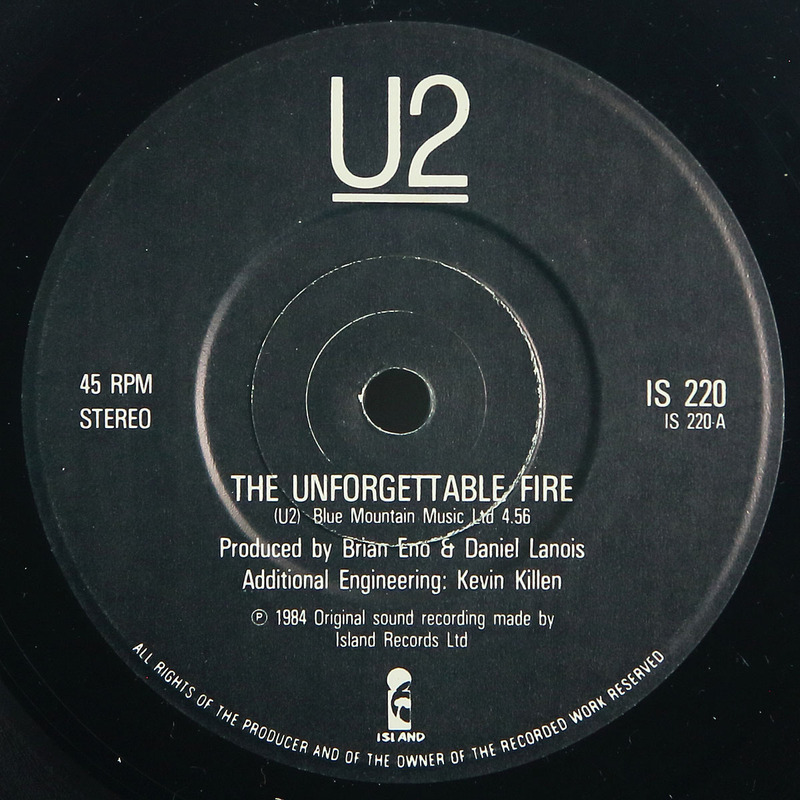 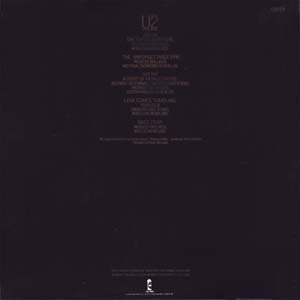 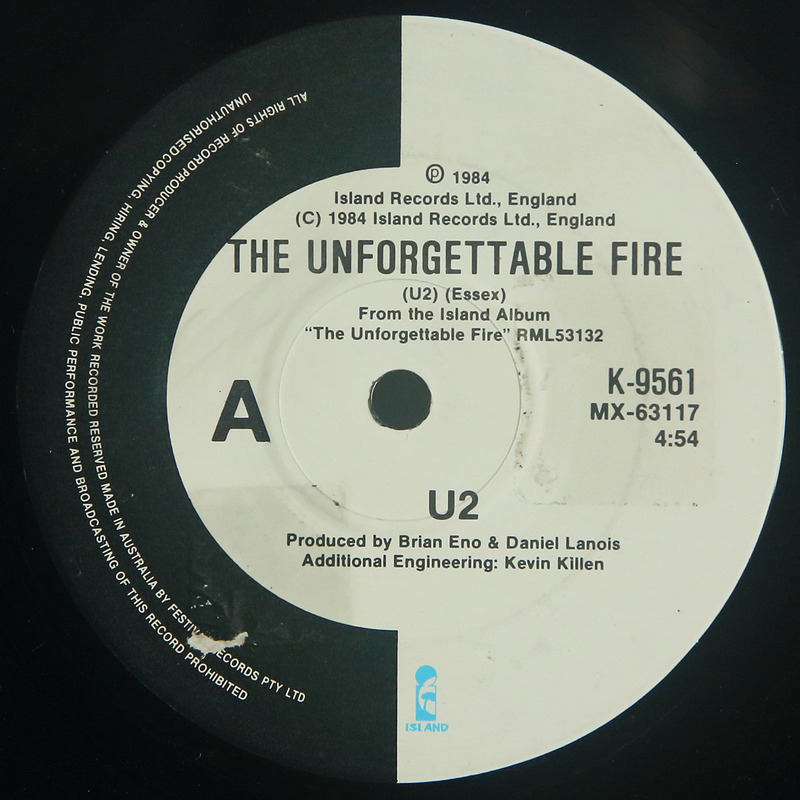 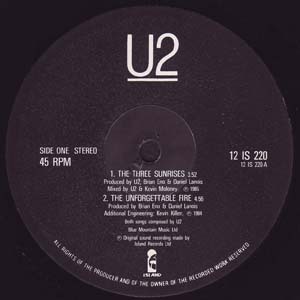 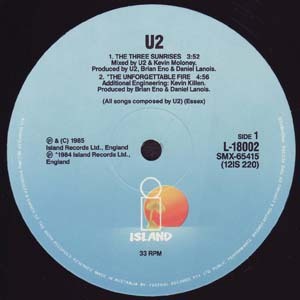 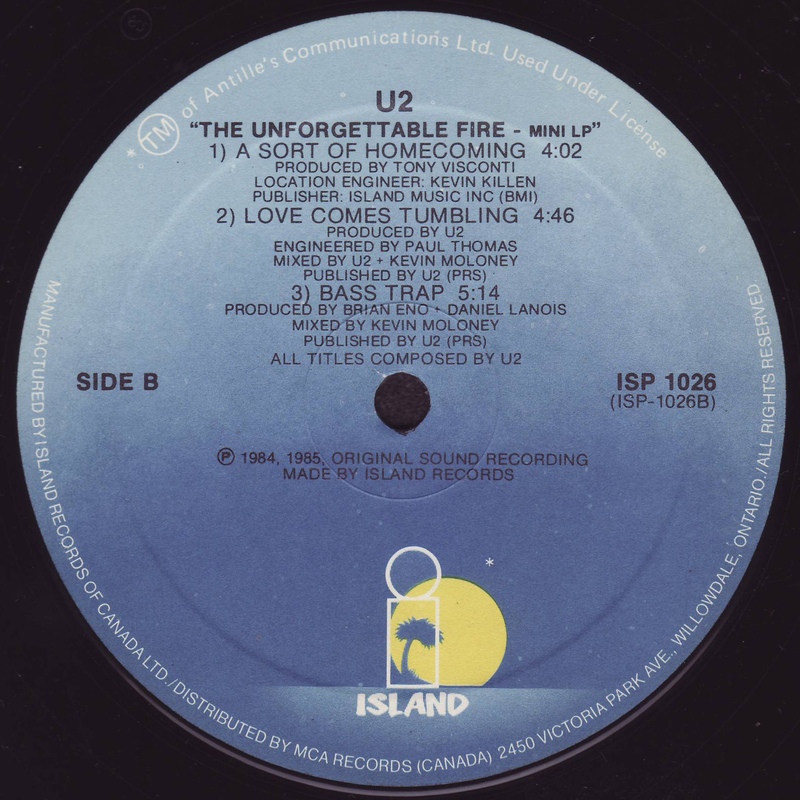 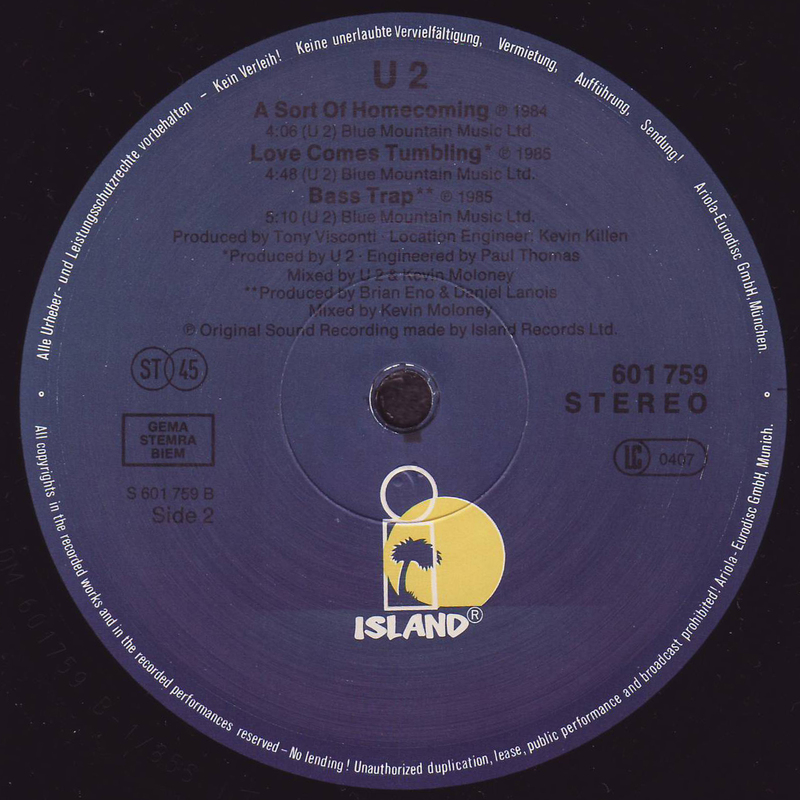 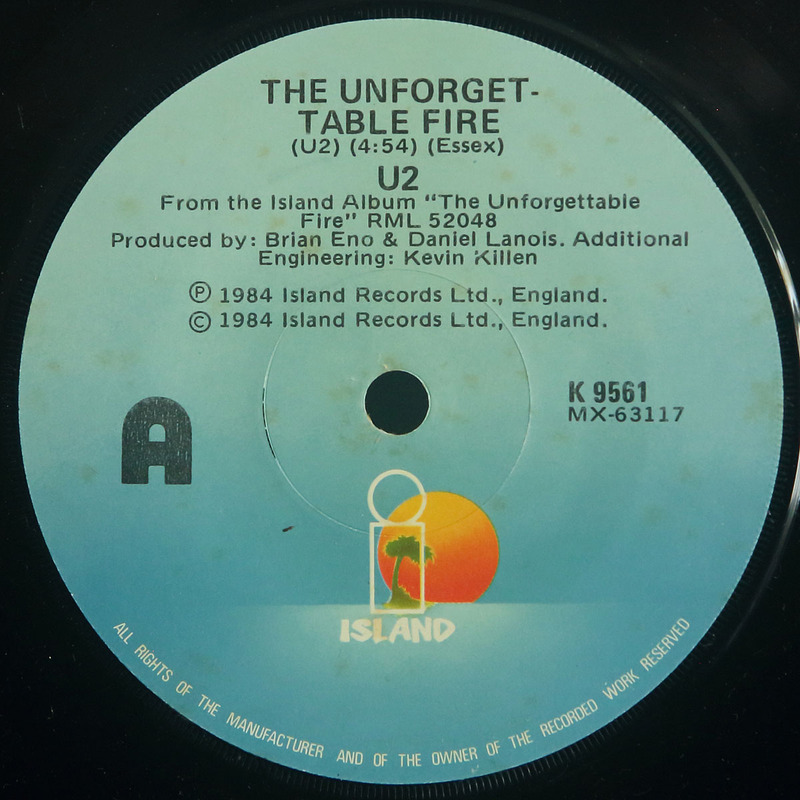 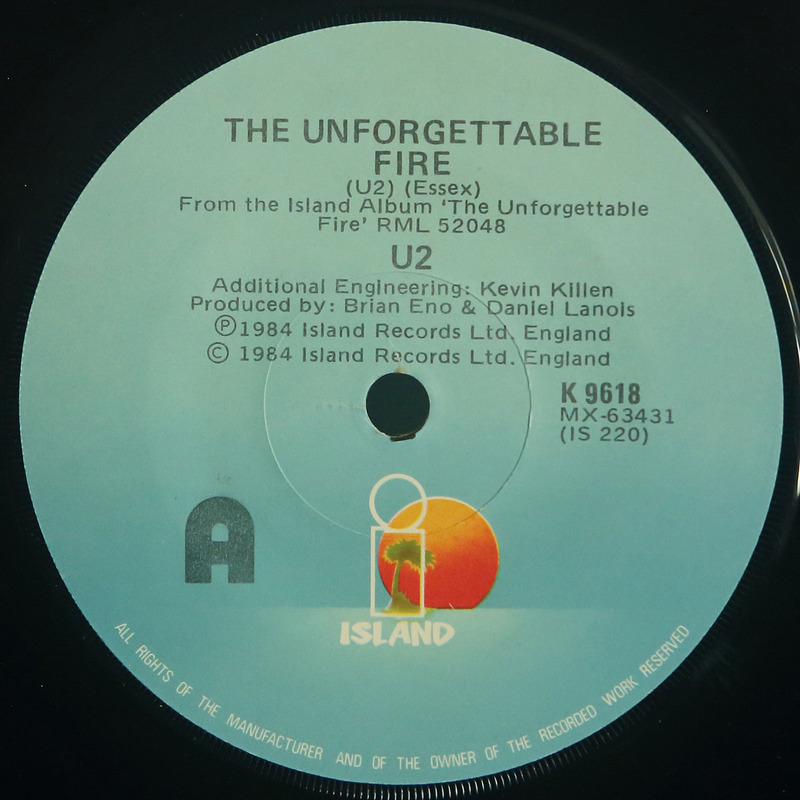 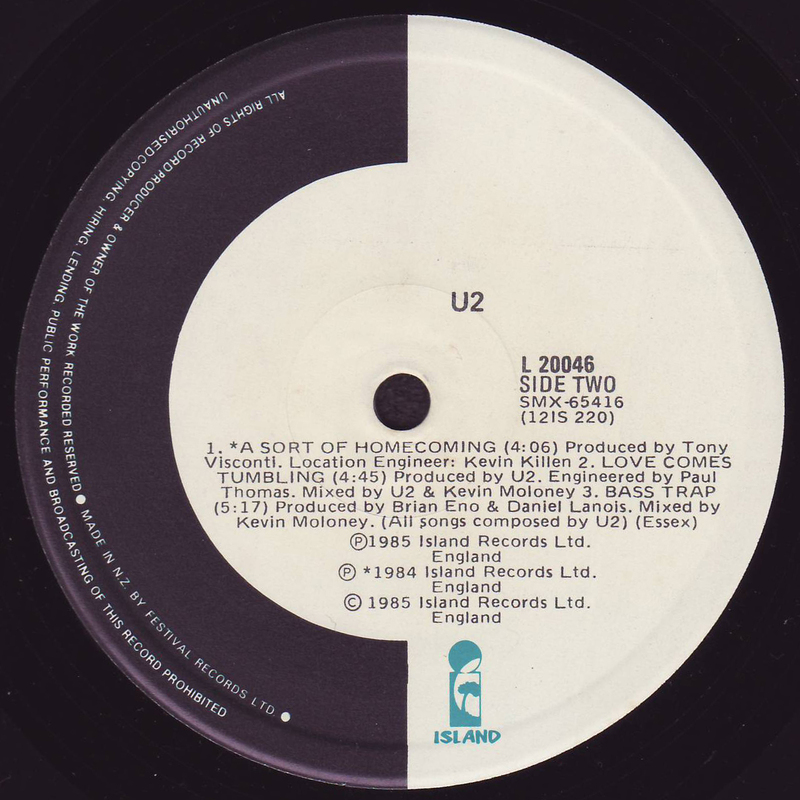 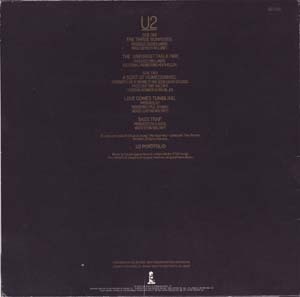 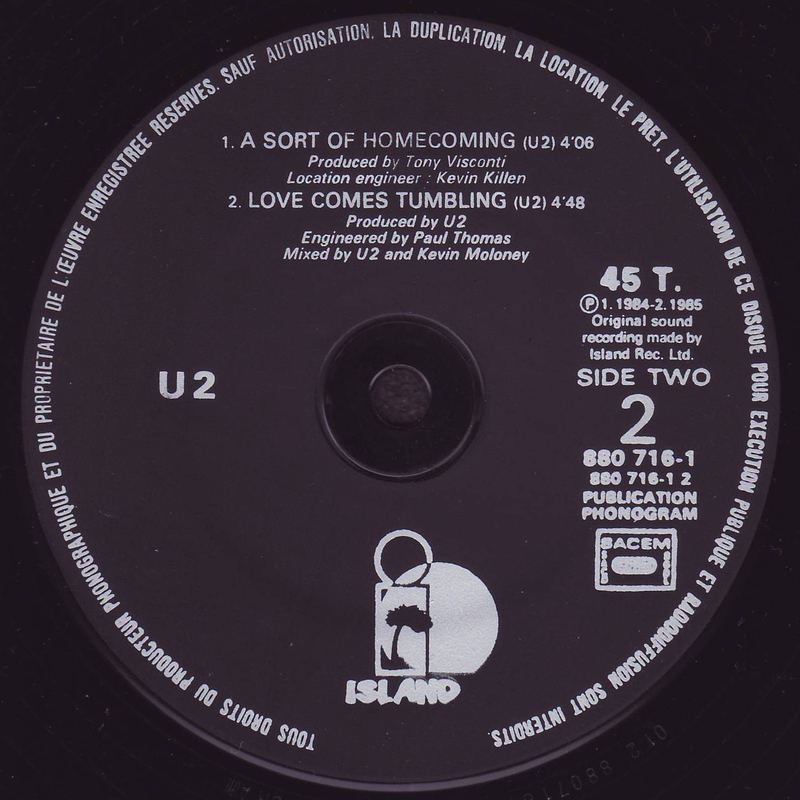 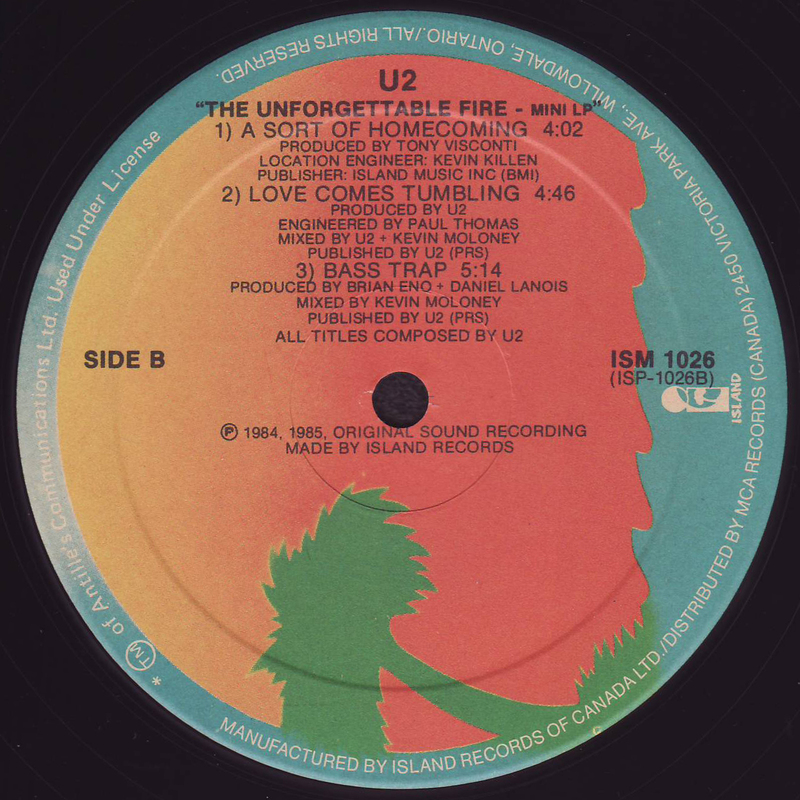 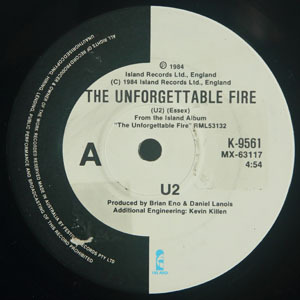 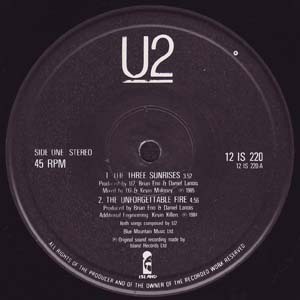 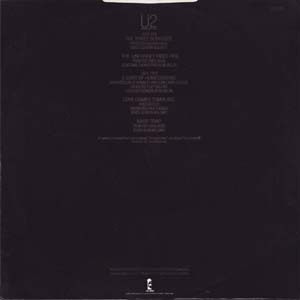 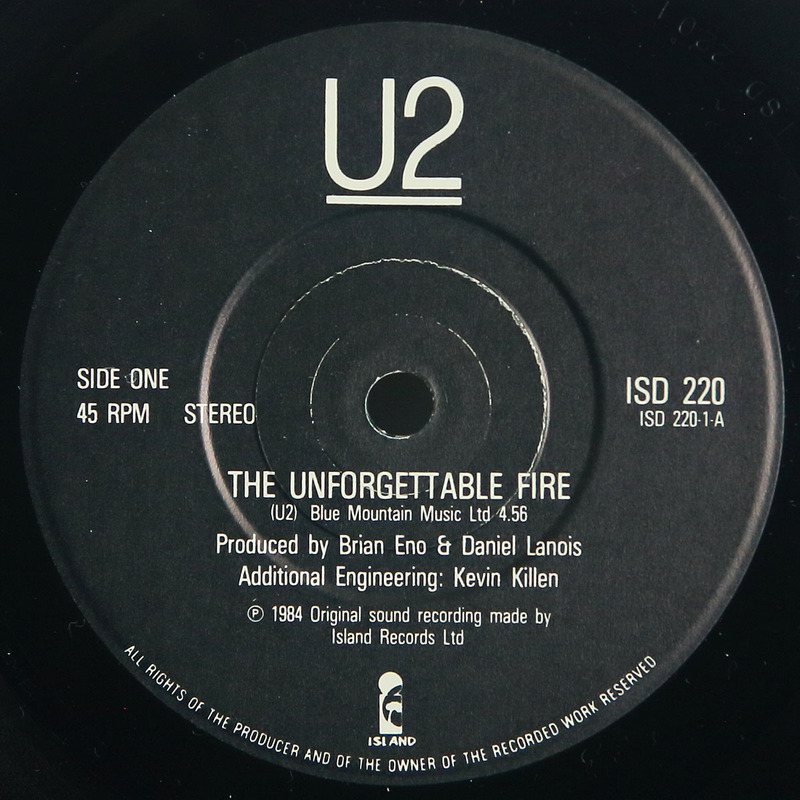 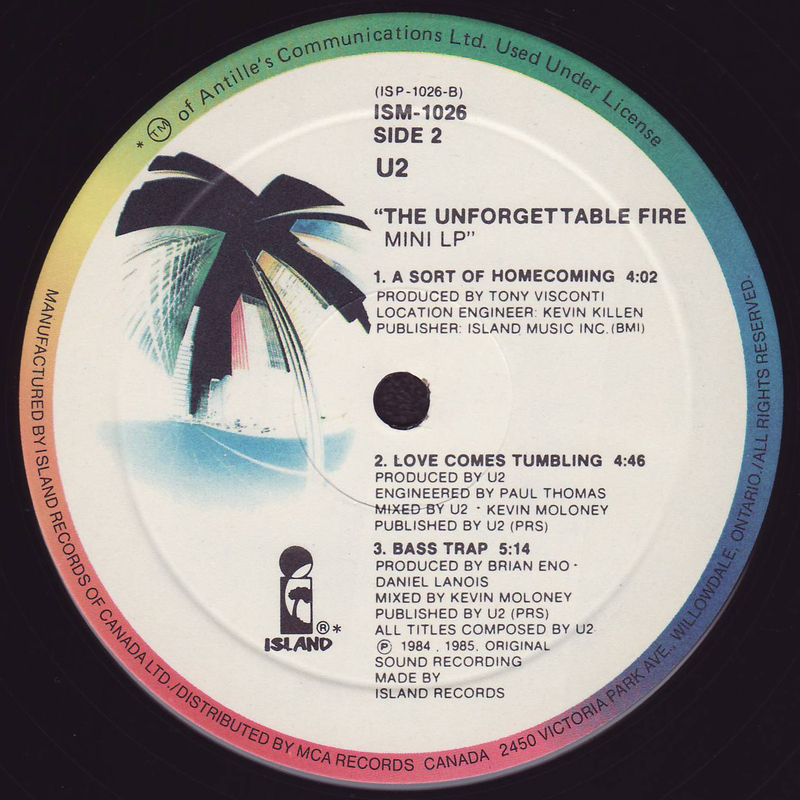 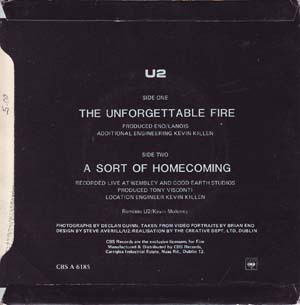 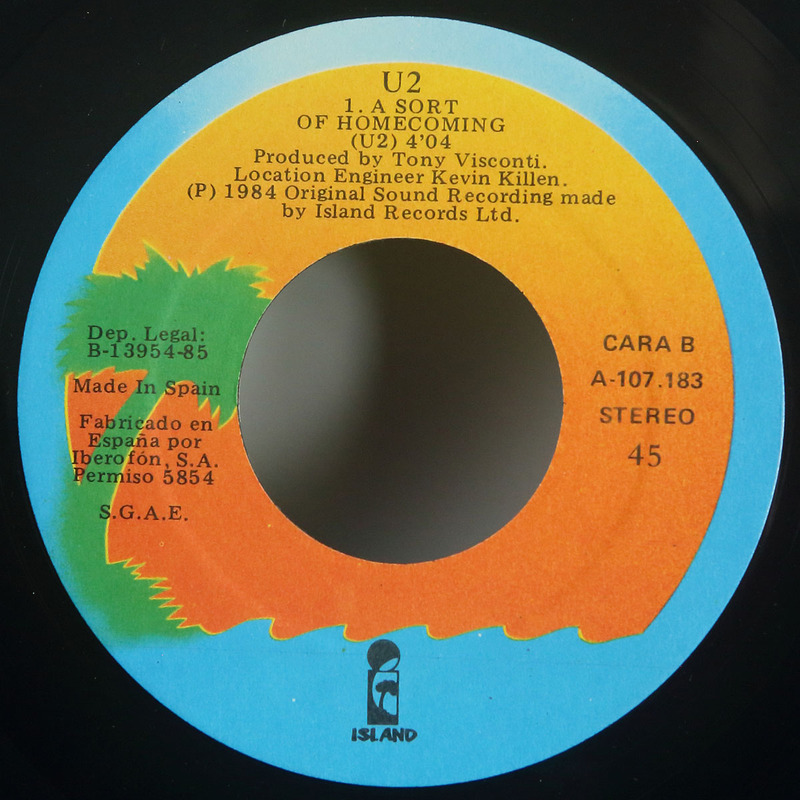 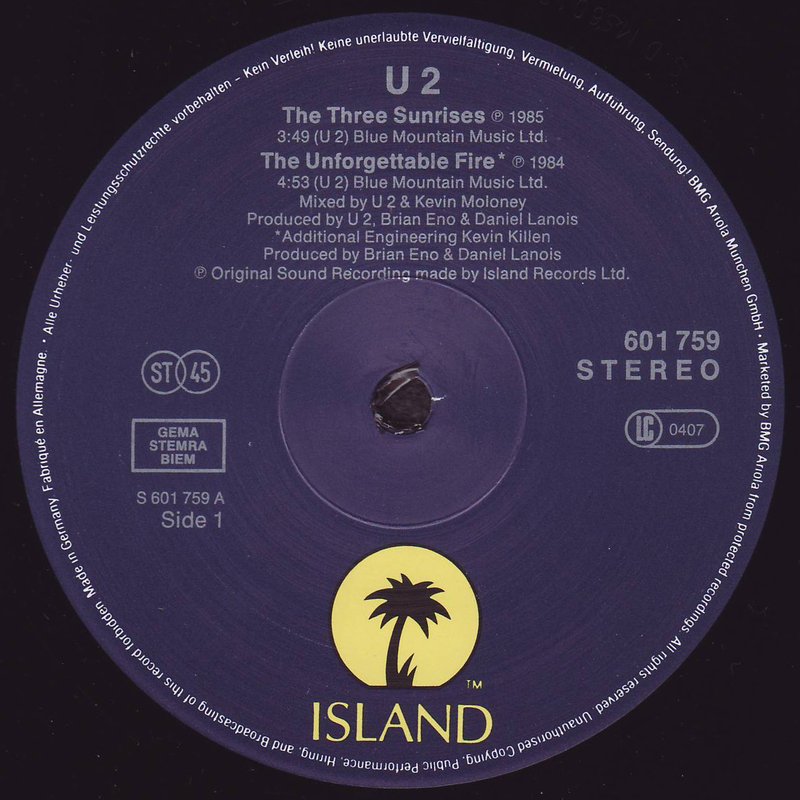 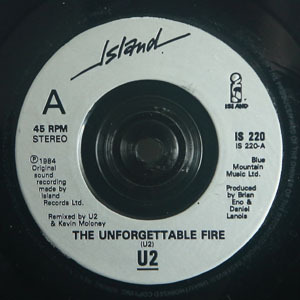 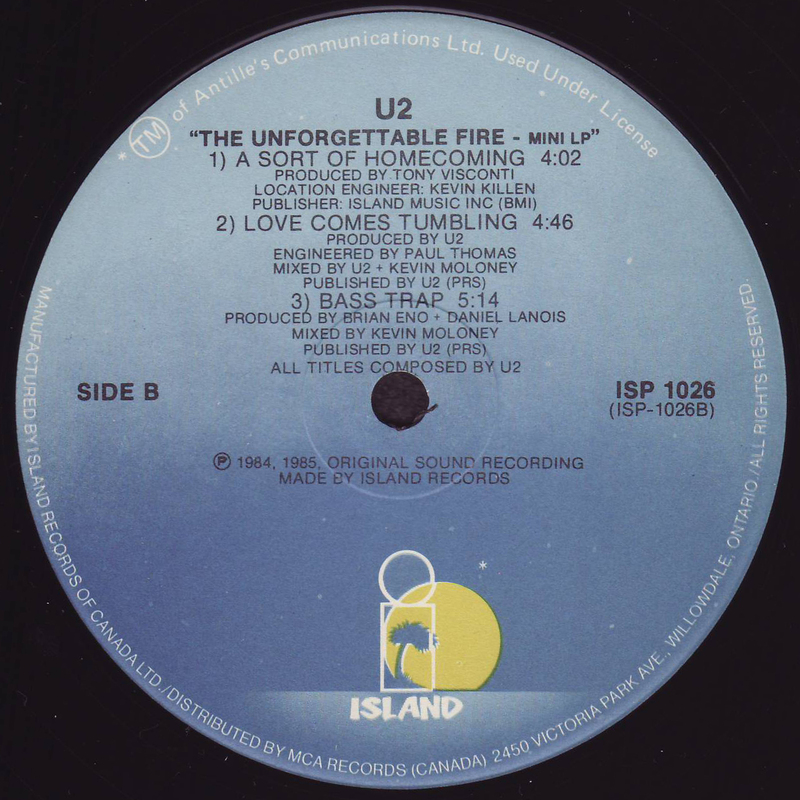 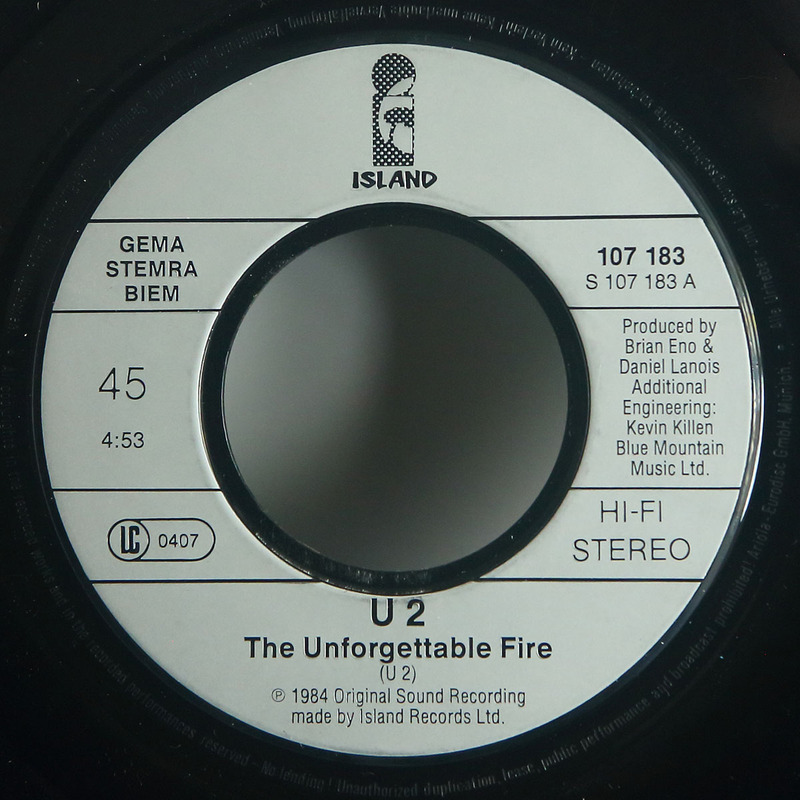 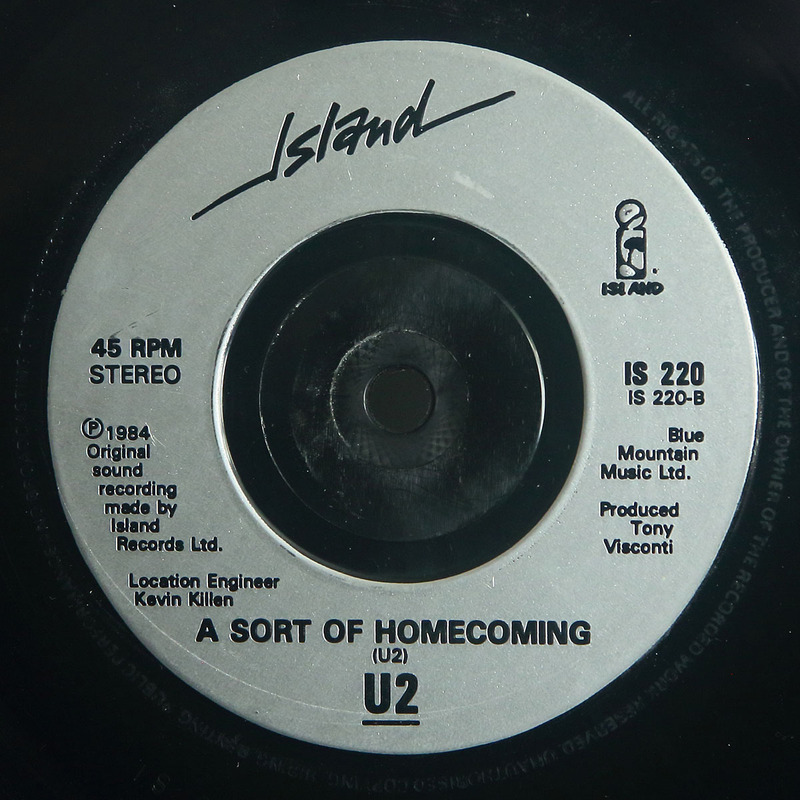 The Unforgettable Fire - 7"
A-Label: Black & white Island. A-Matrix: "6 SMX-63117 W2A 4.54"
B-Label: Black & white Island. B-Matrix: "4 SMX-63118 W2A 2.26"
A-Label: Metallic blue Island with large hole. 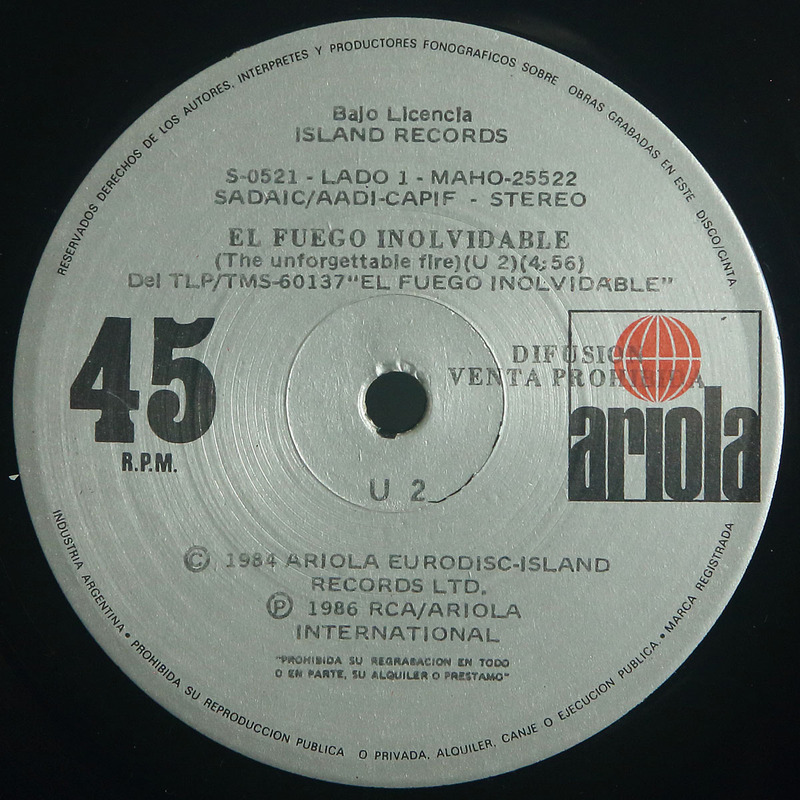 B-Label: Metallic blue Island with large hole. A-Label: Silver Island with large hole. 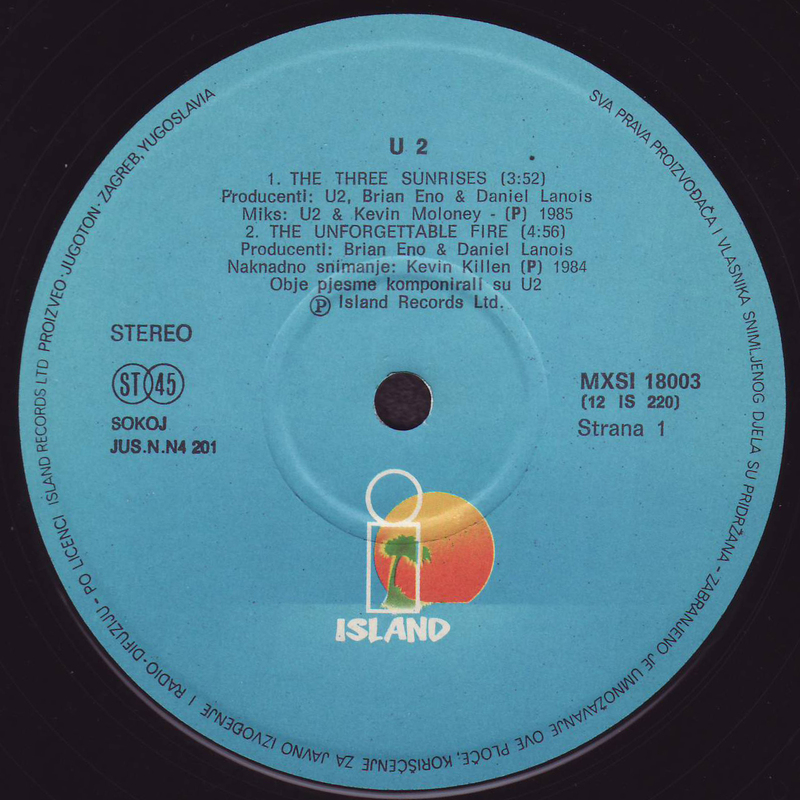 B-Label: Silver Island with large hole. 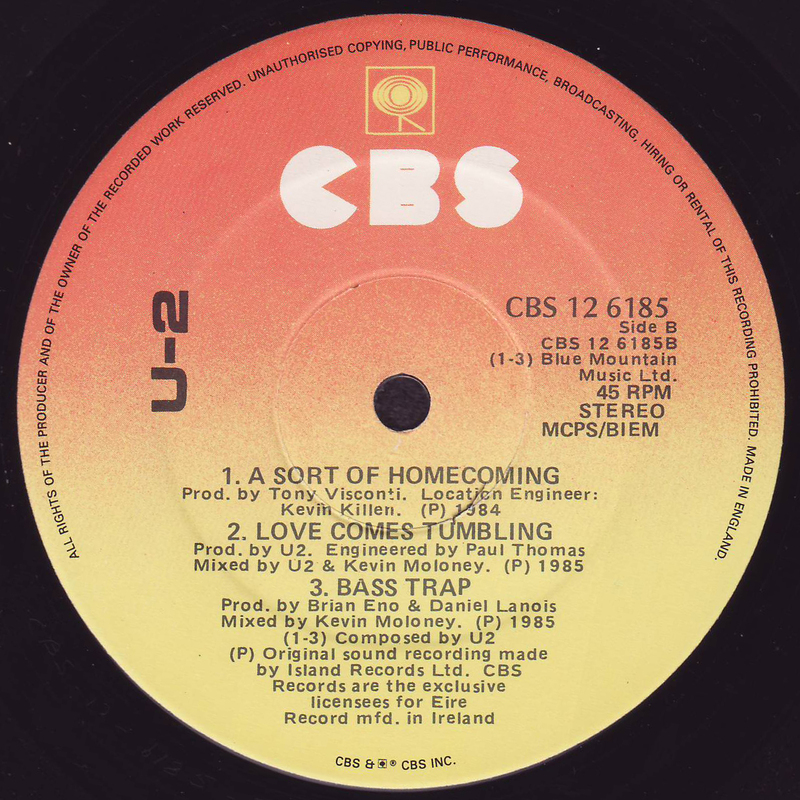 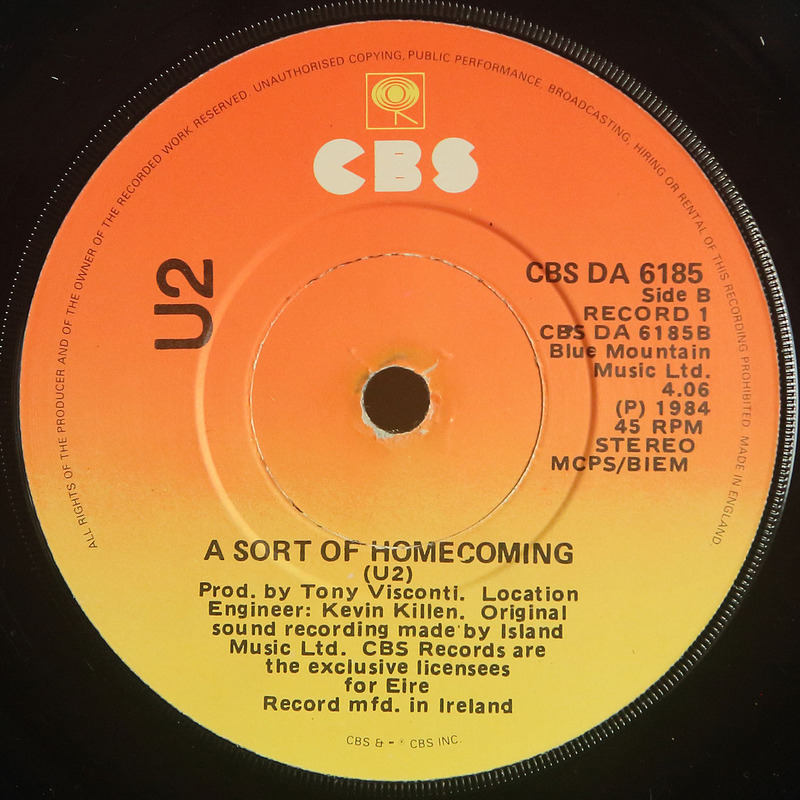 CBS A 6185 - Picture Sleeve, CBS Sunburst Labels with "Made in England" & "CBS & CBS Inc."
Front PS: Exclusive design without "A Sort of Homecoming" in title. 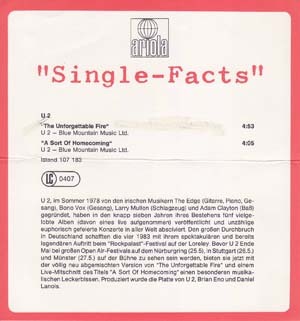 A-Label: Sunburst CBS with "Made in England" on right hand side and with "CBS & CBS Inc." at bottom. 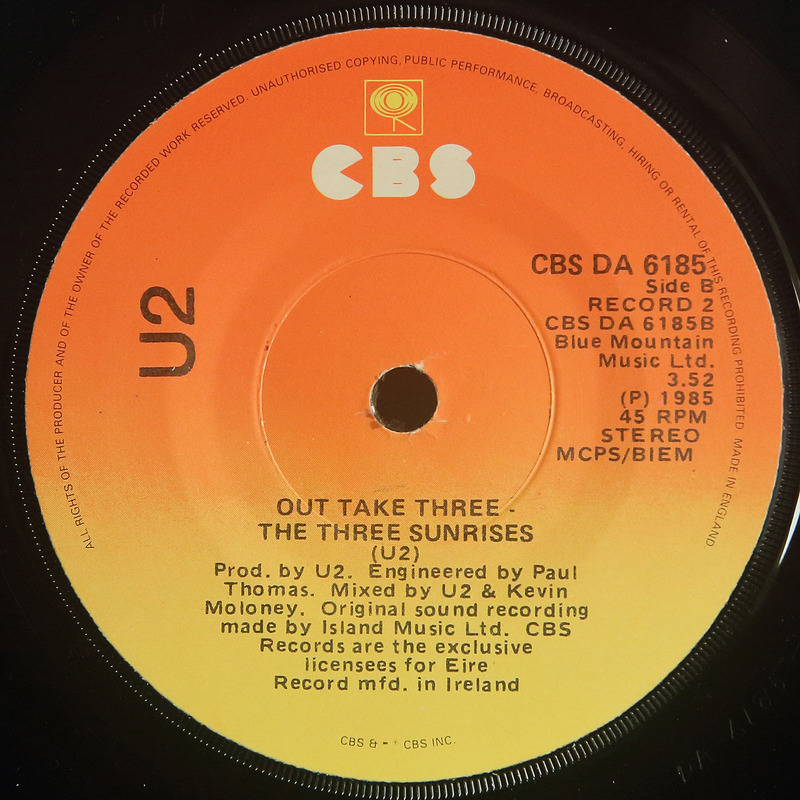 B-Label: Sunburst CBS with "Made in England" on right hand side and with "CBS & CBS Inc." at bottom. CBS DA 6185 - Double-pack - Picture Sleeve, CBS Sunburst Labels with "Made in England" & "CBS & CBS Inc."
1A-Label: ﻿Sunburst CBS with "Made in England" on right hand side and with "CBS & CBS Inc." at bottom. 1A-Matrix: "CBS-DA-6185-A RECORD-1-A CP YII"
1B-Label: Sunburst CBS with "Made in England" on right hand side and with "CBS & CBS Inc." at bottom. 1B-Matrix: "CBS-DA-6185-B RECORD-1-B CP YII"
2A-Label: ﻿Sunburst CBS with "Made in England" on right hand side and with "CBS & CBS Inc." at bottom. 2A-Matrix: "CBS-DA-6185-A RECORD-2-A CP YII"
2B-Label: Sunburst CBS with "Made in England" on right hand side and with "CBS & CBS Inc." at bottom. 2B-Matrix: "CBS-DA-6185-B RECORD-2-B CP YII"
A-Label: Blue & white Island palm tree with large hole. B-Label: Blue & white Island palm tree with large hole. A-Matrix: "SMX-63117 K 9561 SIDE A W2A 4.54"
B-Matrix: "SMX-63118 K 9561 SIDE B W2A 2.26"
A-Matrix: "SMX-63431 W2A 4.56 K 9618 - A"
B-Matrix: "SMX-63432 W2A 4.06 K 9618 - B"
A-Matrix: "A 107183 A IN3"
B-Matrix: "A 107183 B IN3"
Back PS: Small round thumb-cut. Back PS: Long thin thumb-cut. 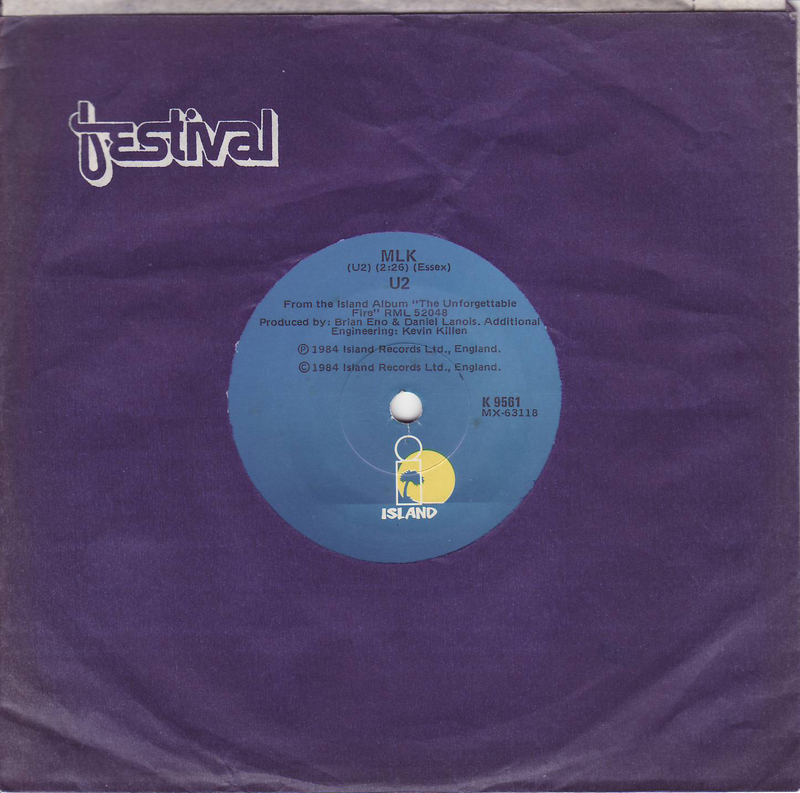 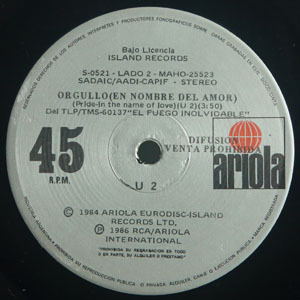 A-Label: Black Island with large hole. 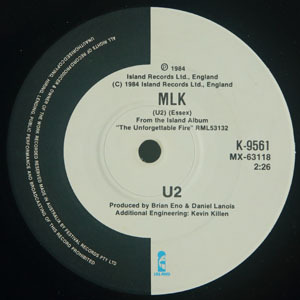 B-Label: Black Island with large hole. 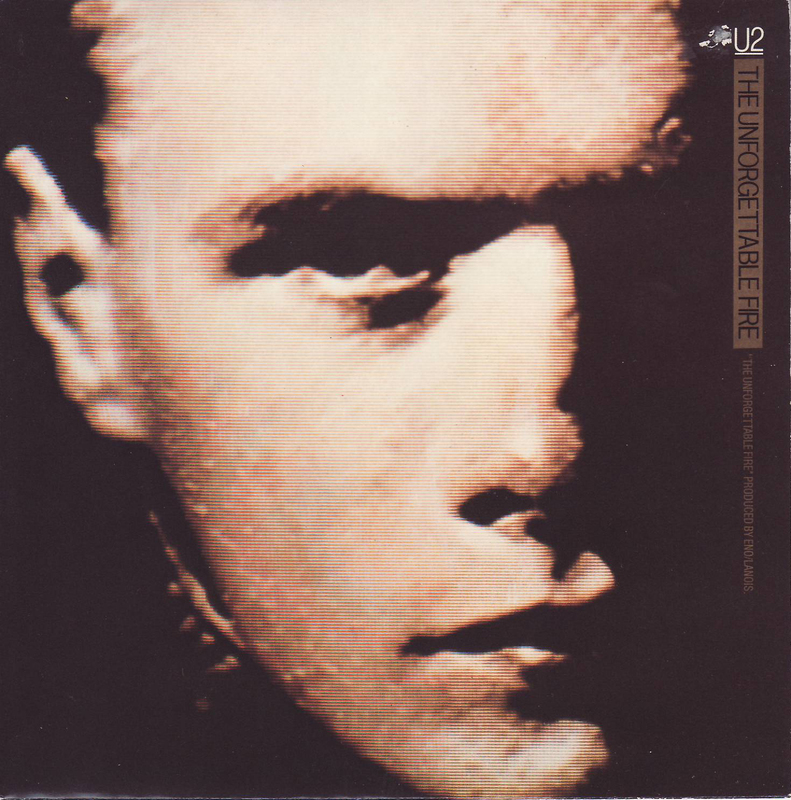 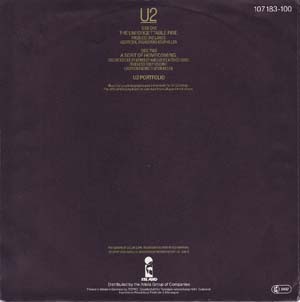 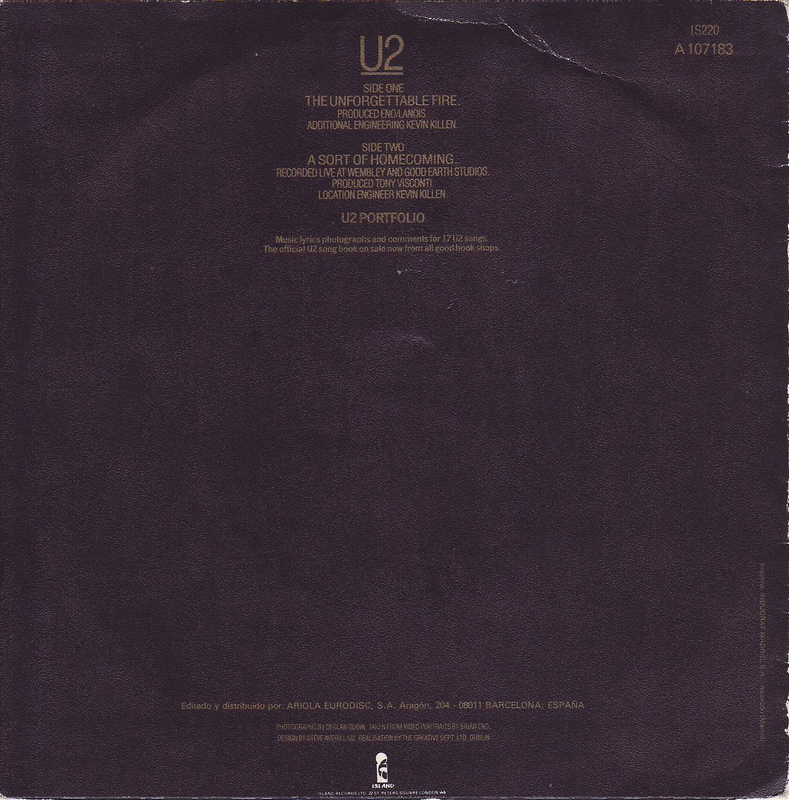 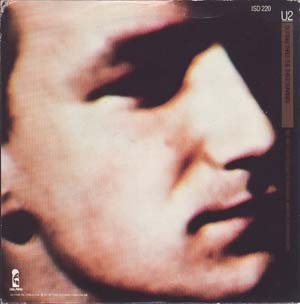 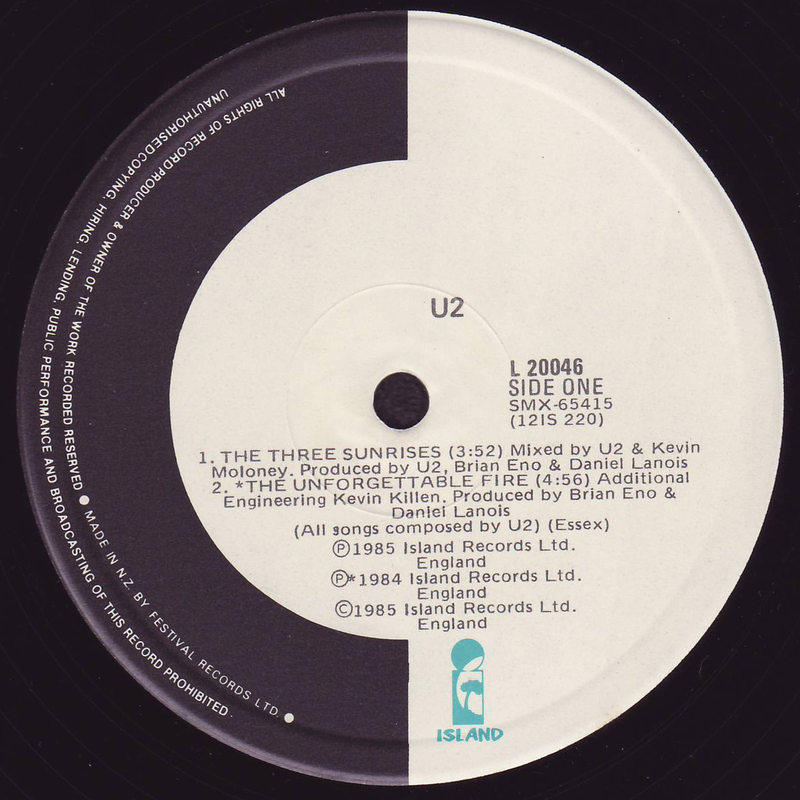 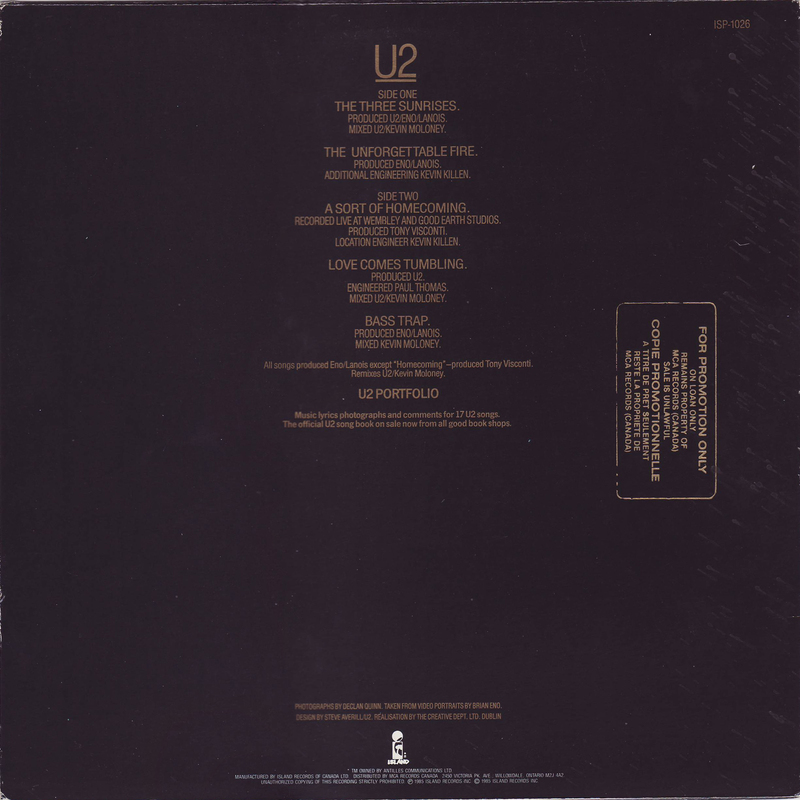 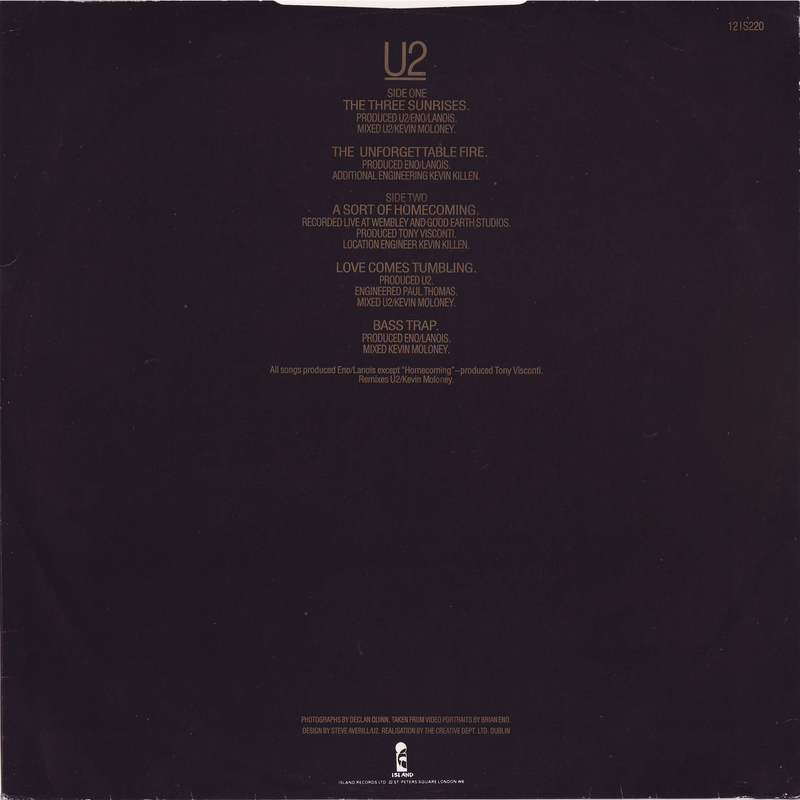 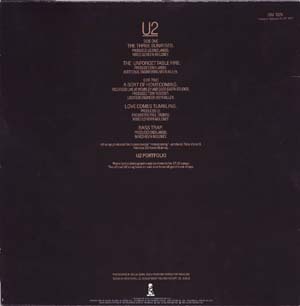 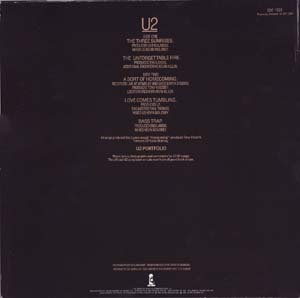 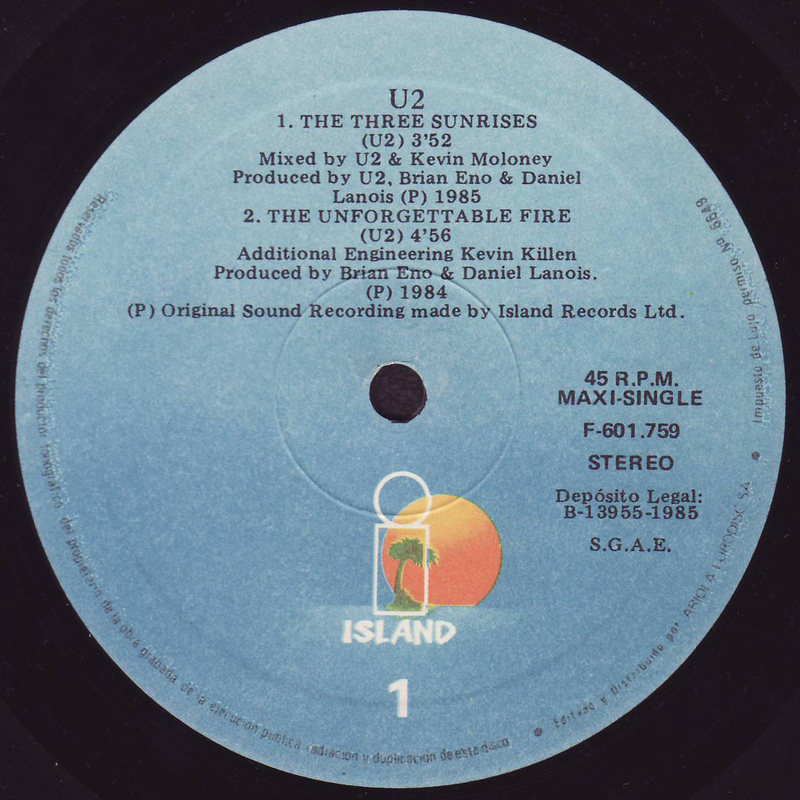 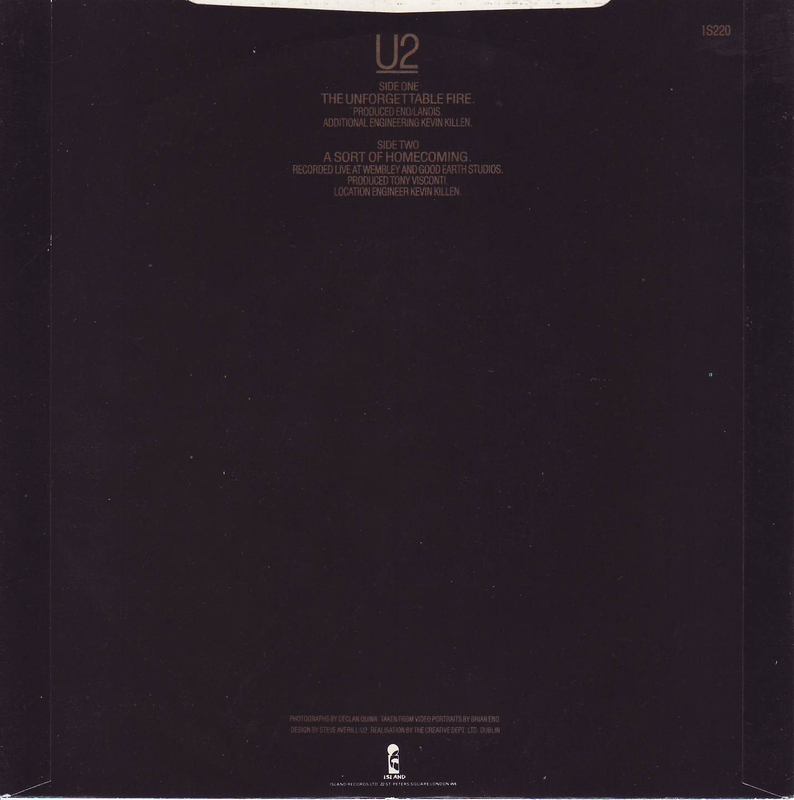 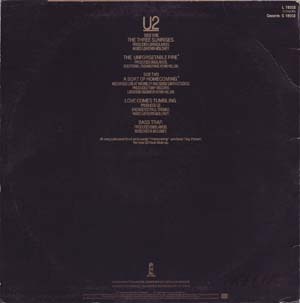 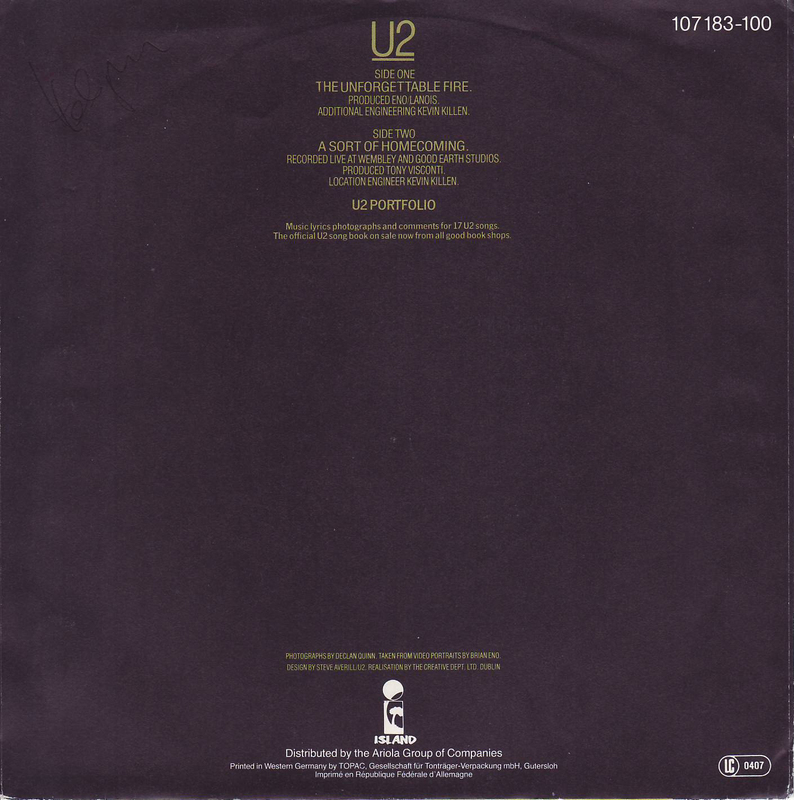 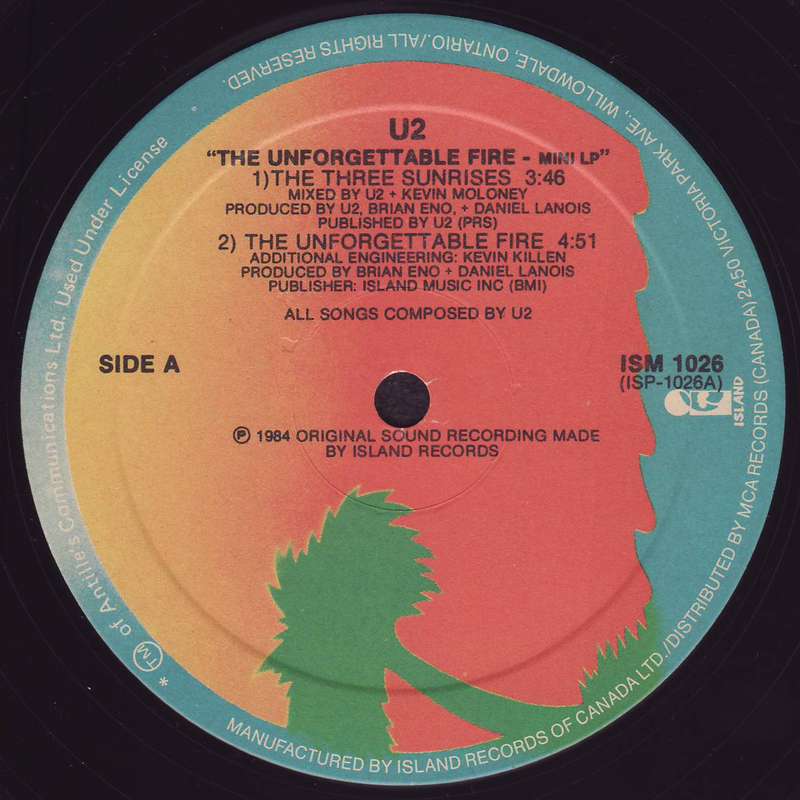 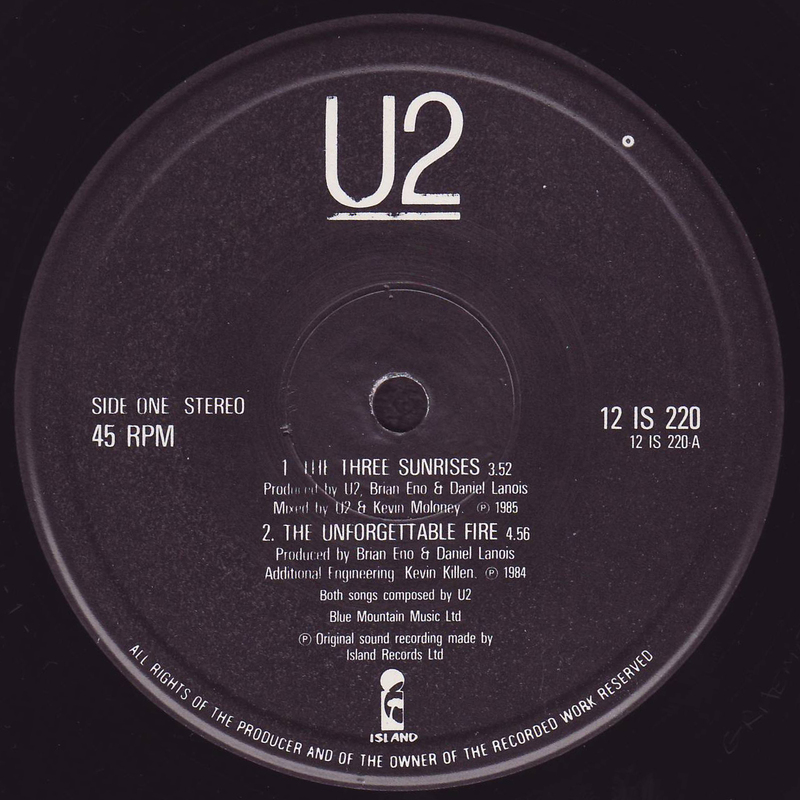 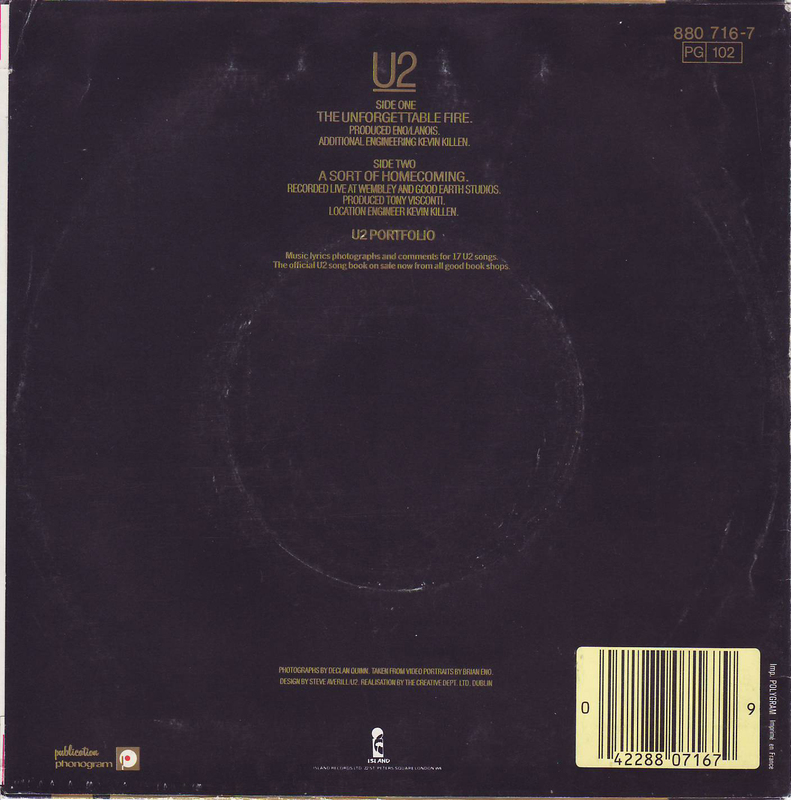 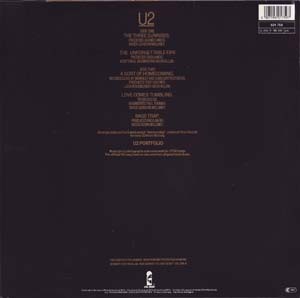 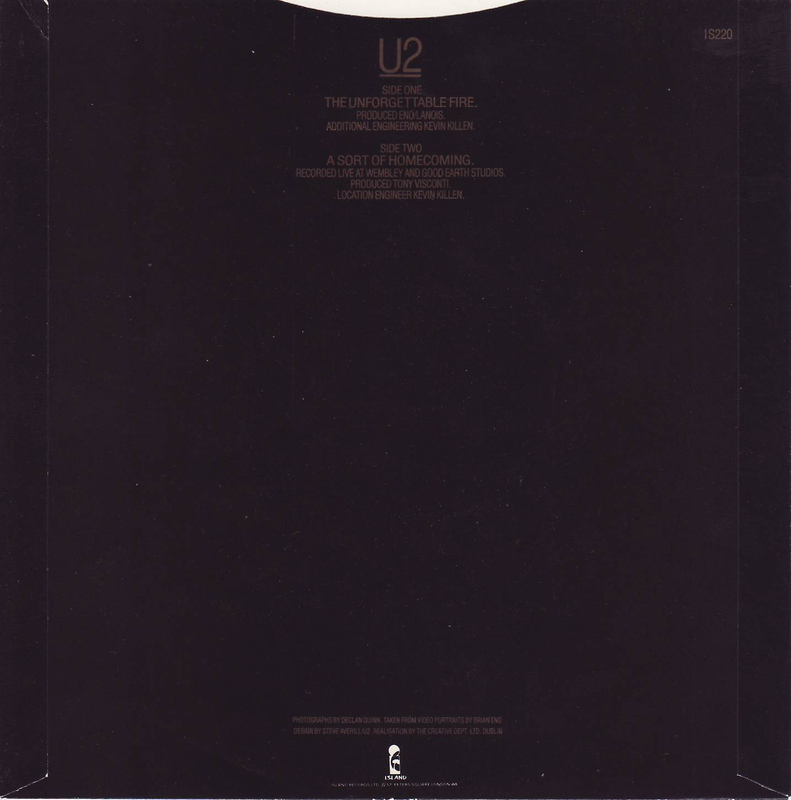 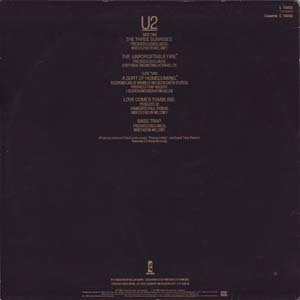 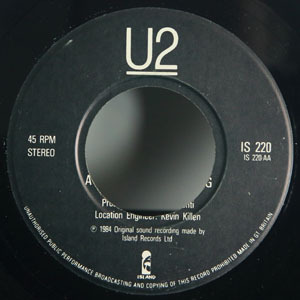 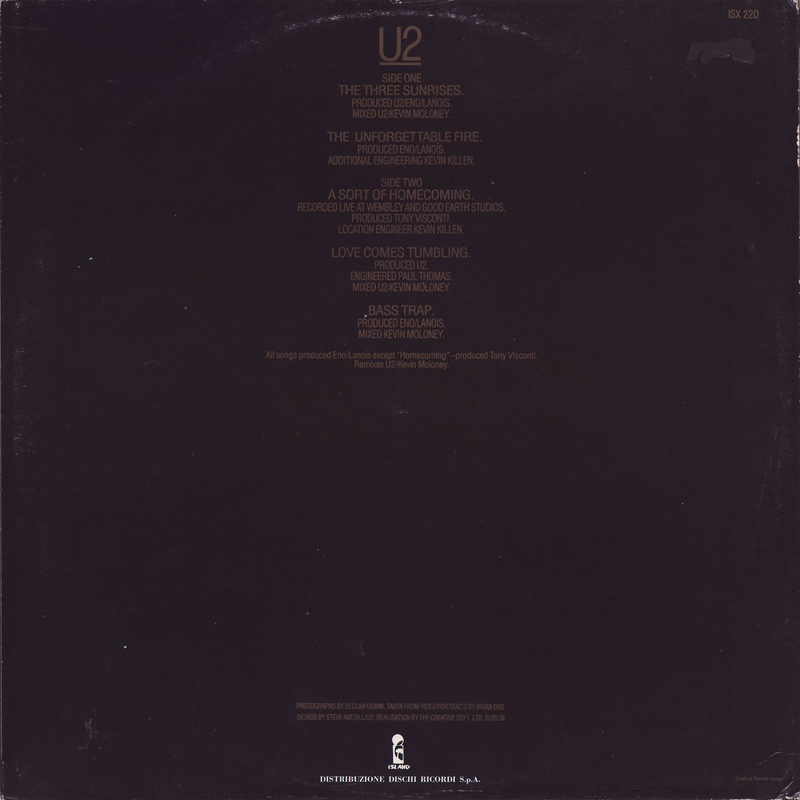 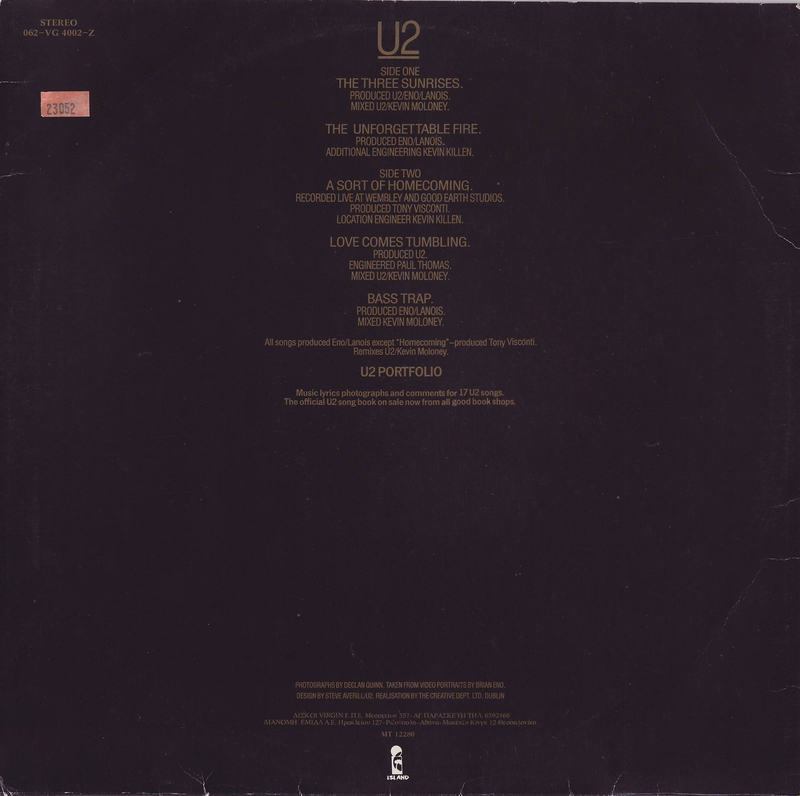 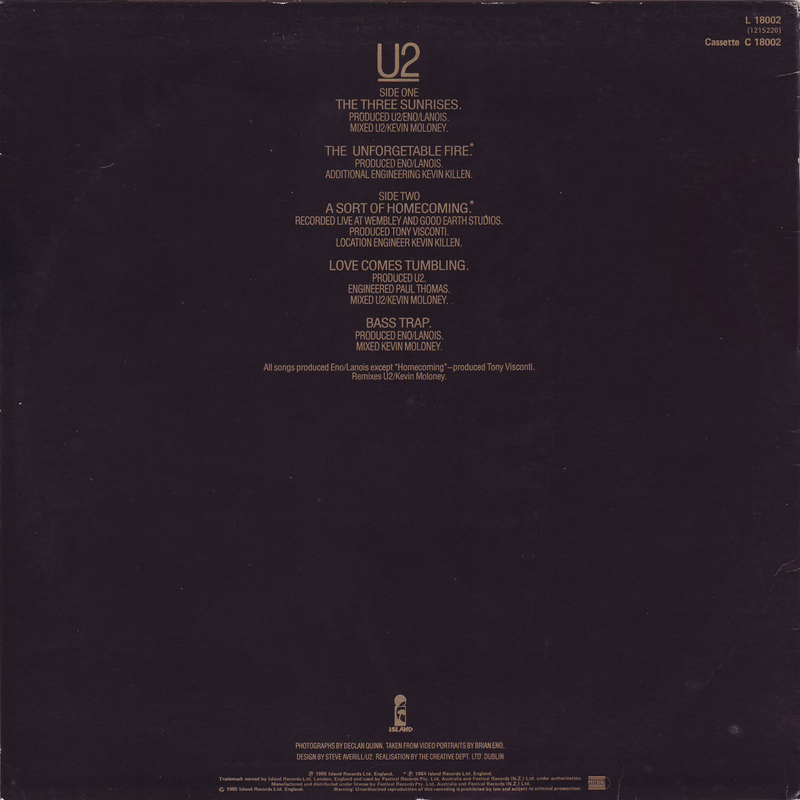 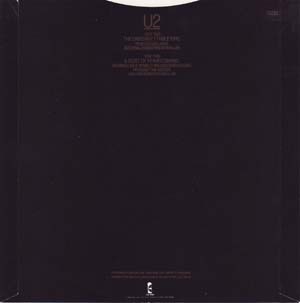 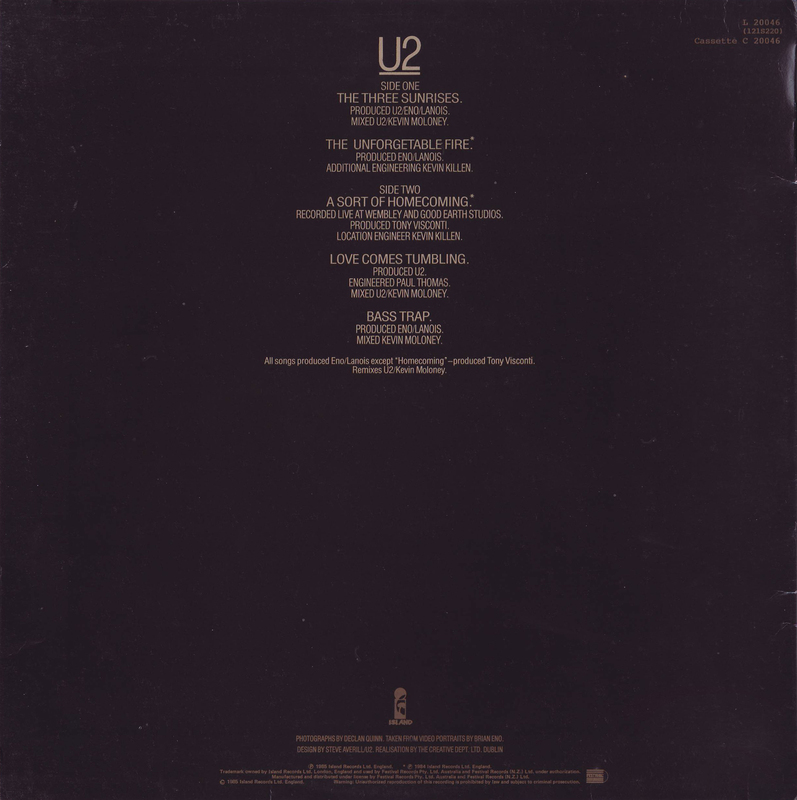 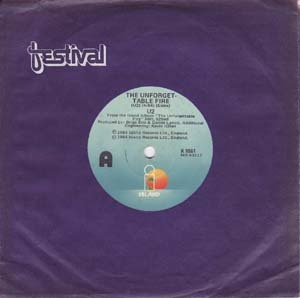 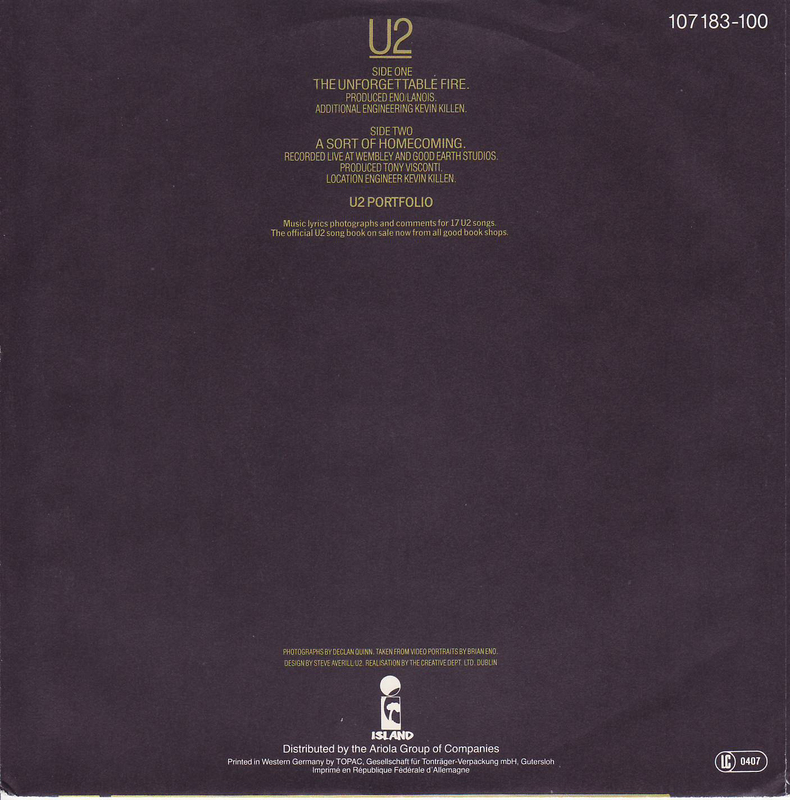 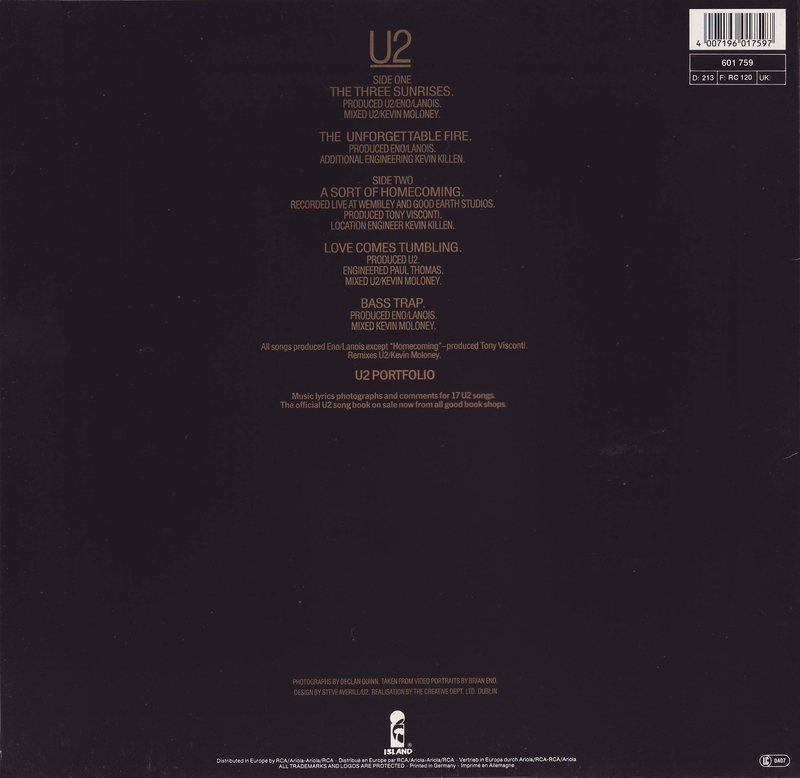 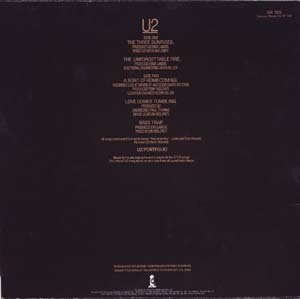 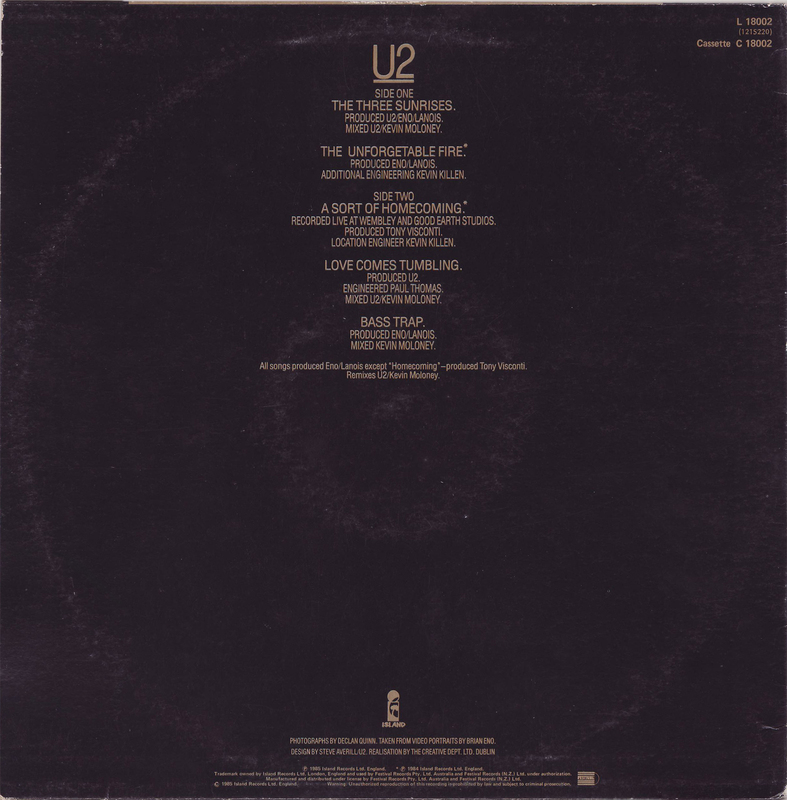 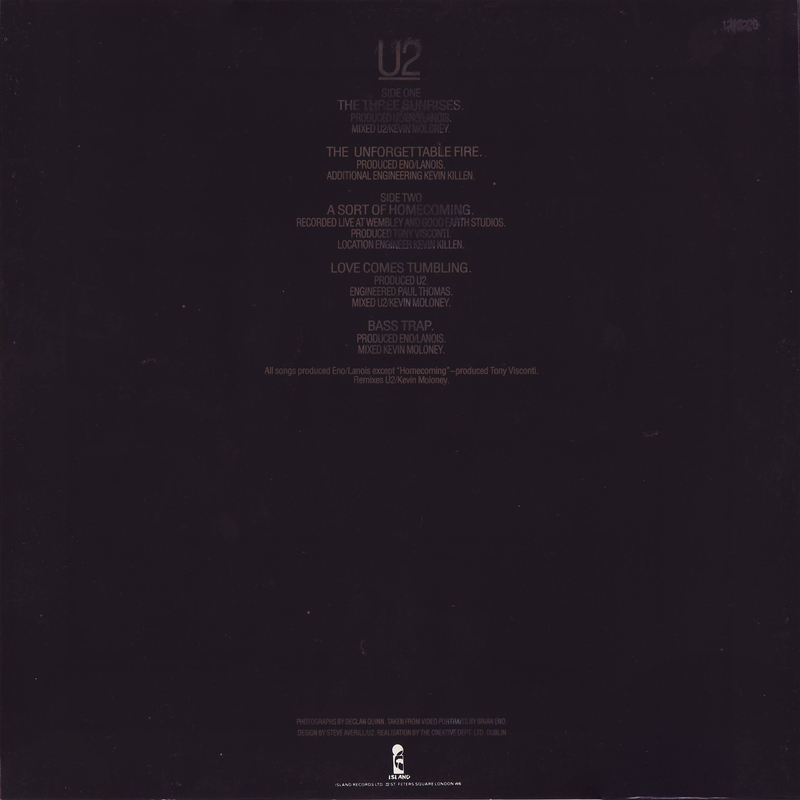 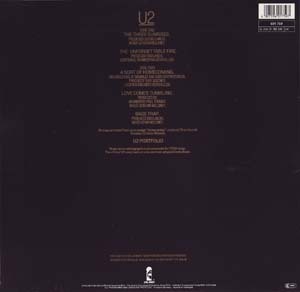 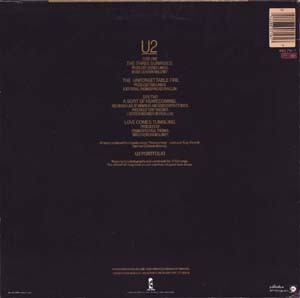 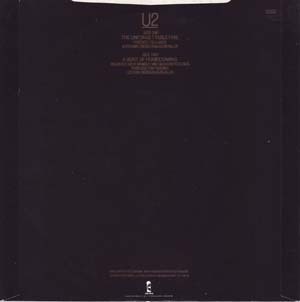 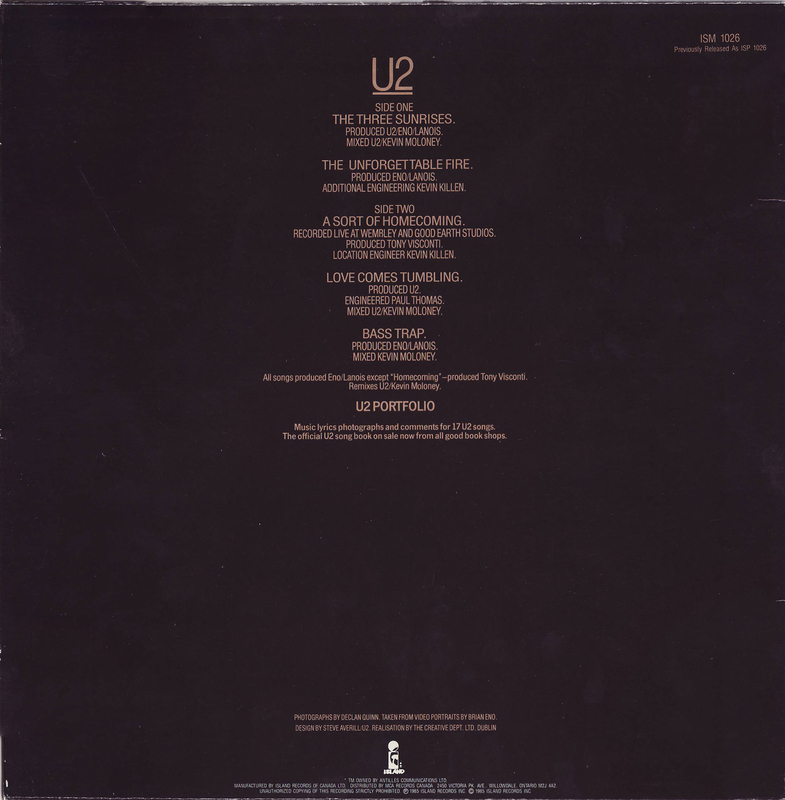 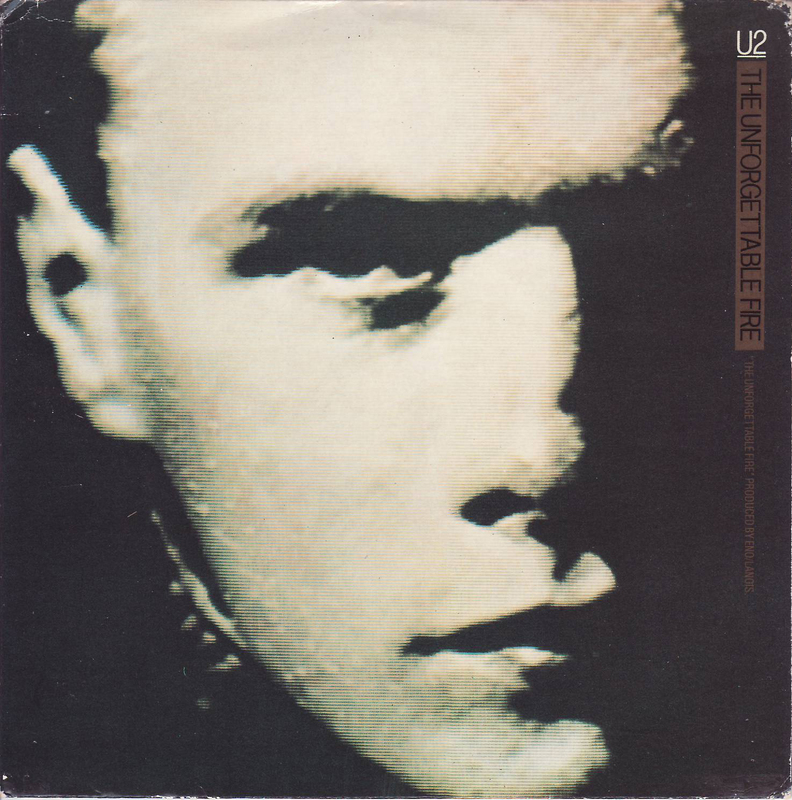 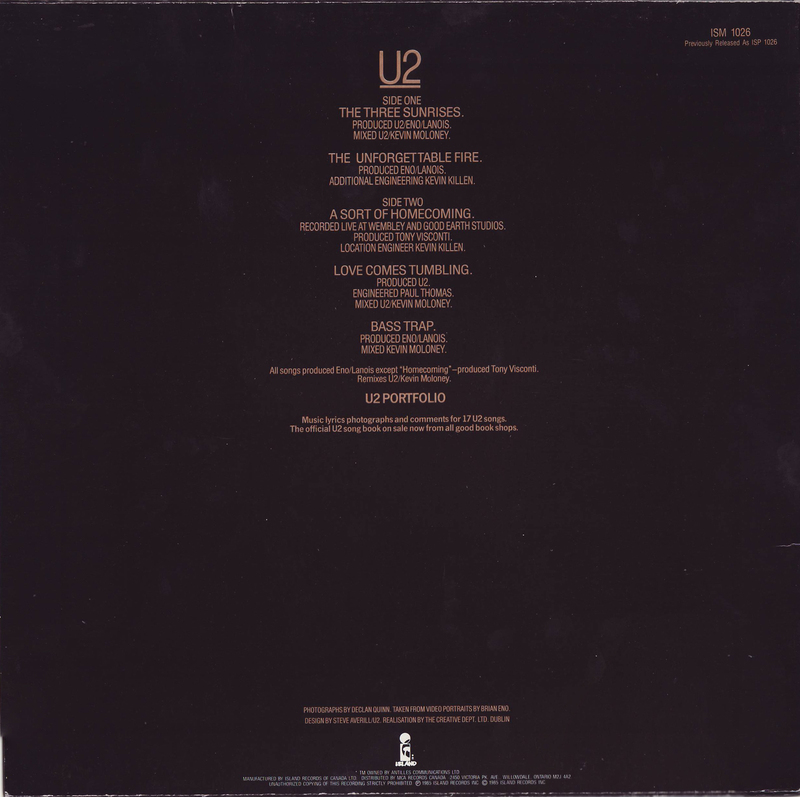 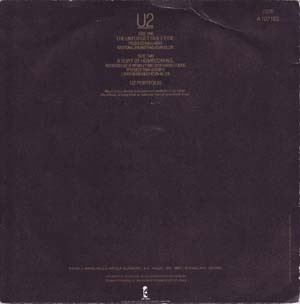 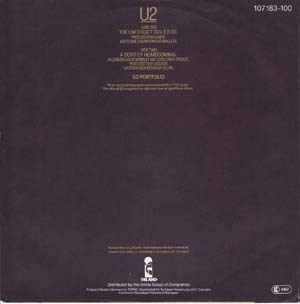 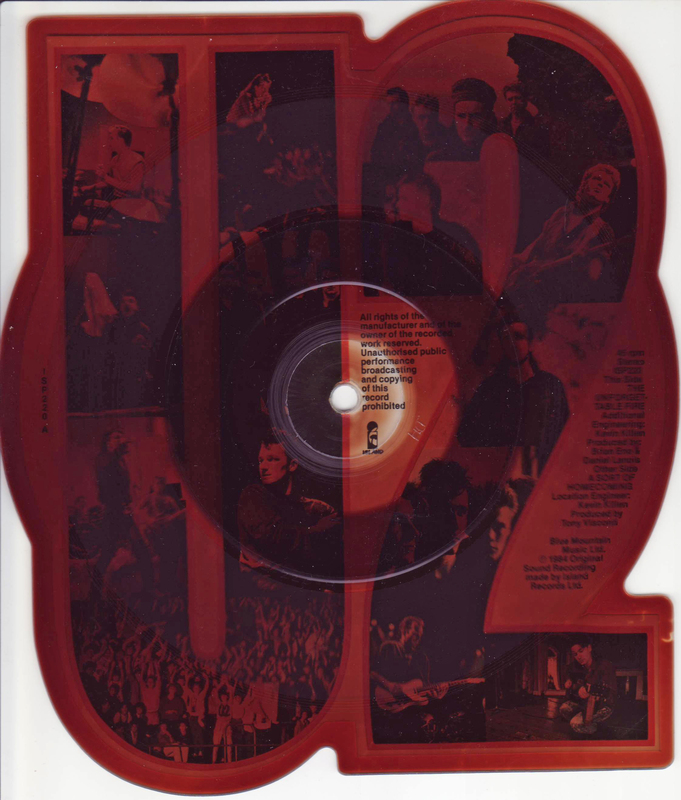 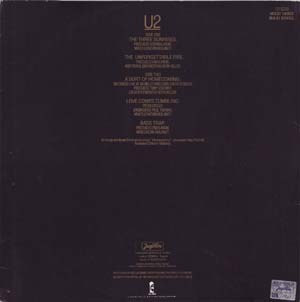 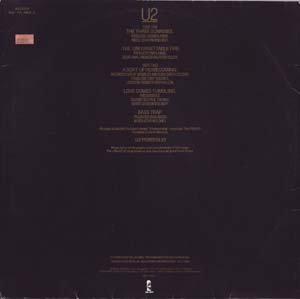 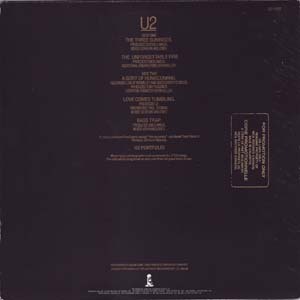 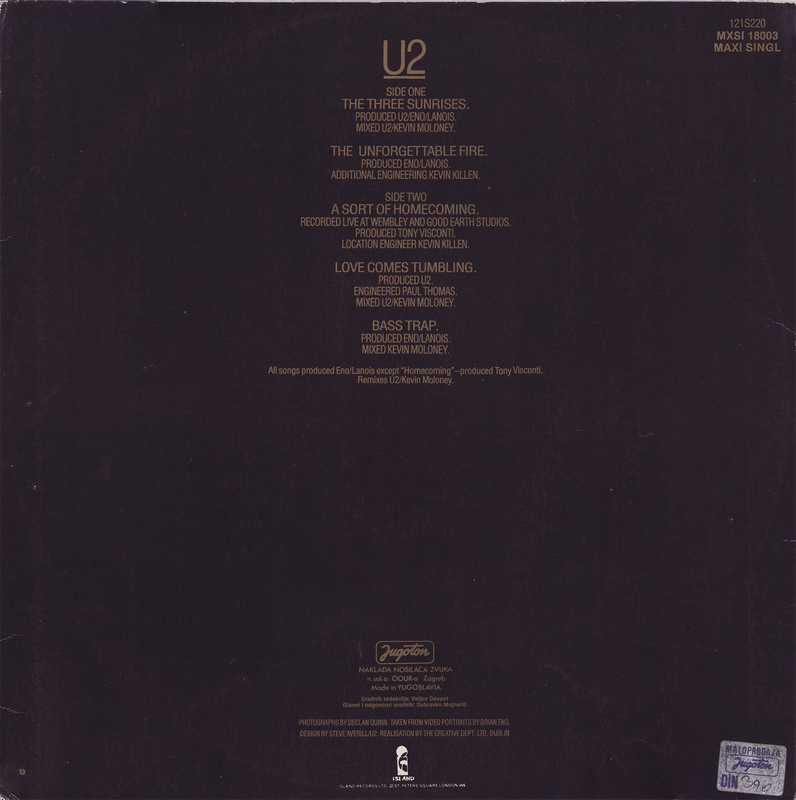 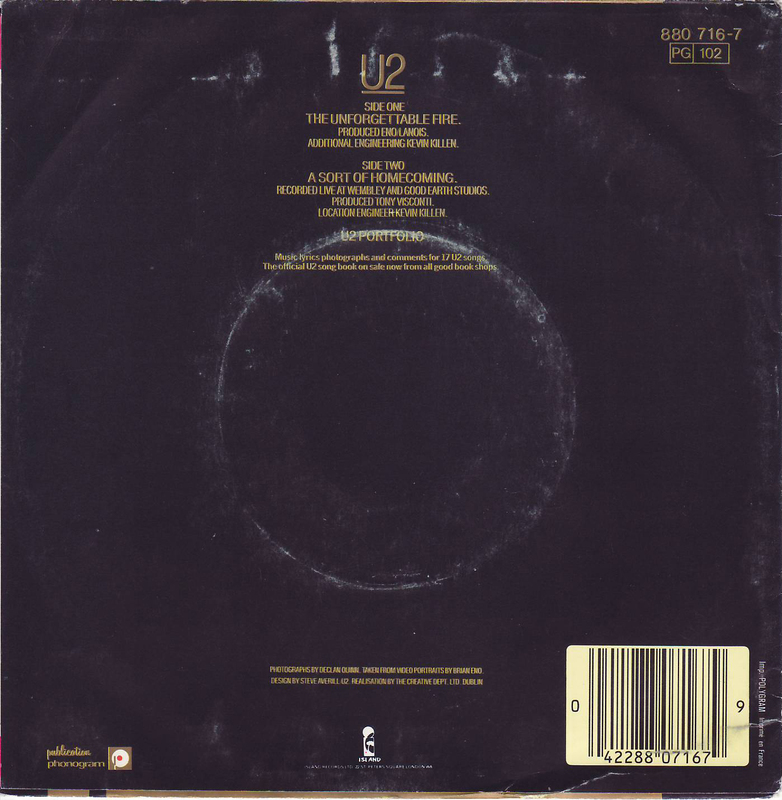 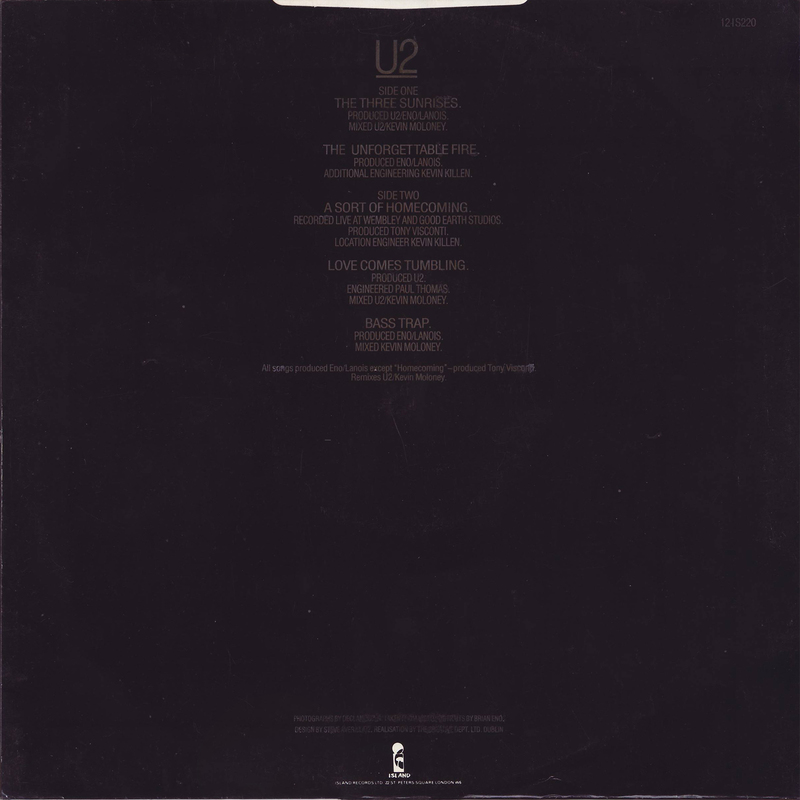 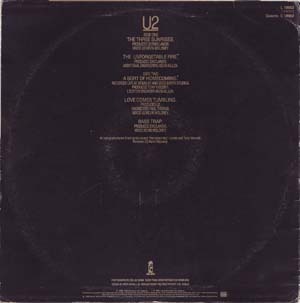 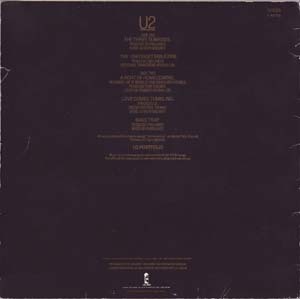 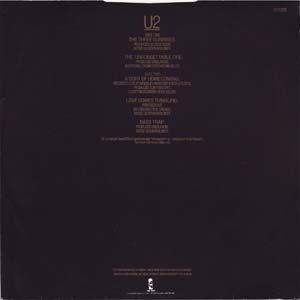 The Unforgettable Fire - 12"
A-Matrix: "2 SMX 65415 P2B2"
B-Matrix: "2 SMX 65416 P2A"
Front PS: With back & white sticker. 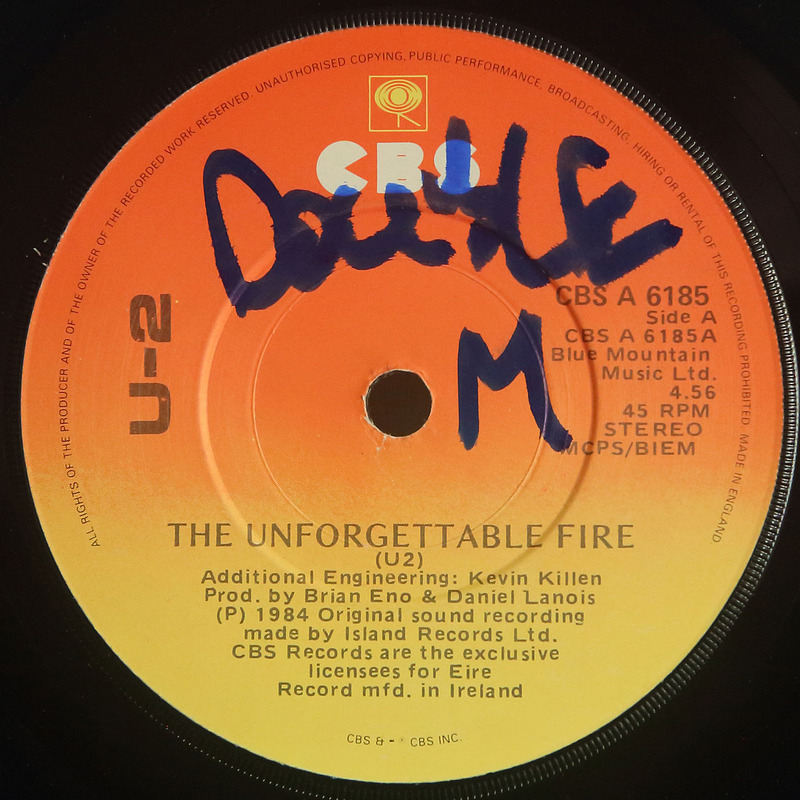 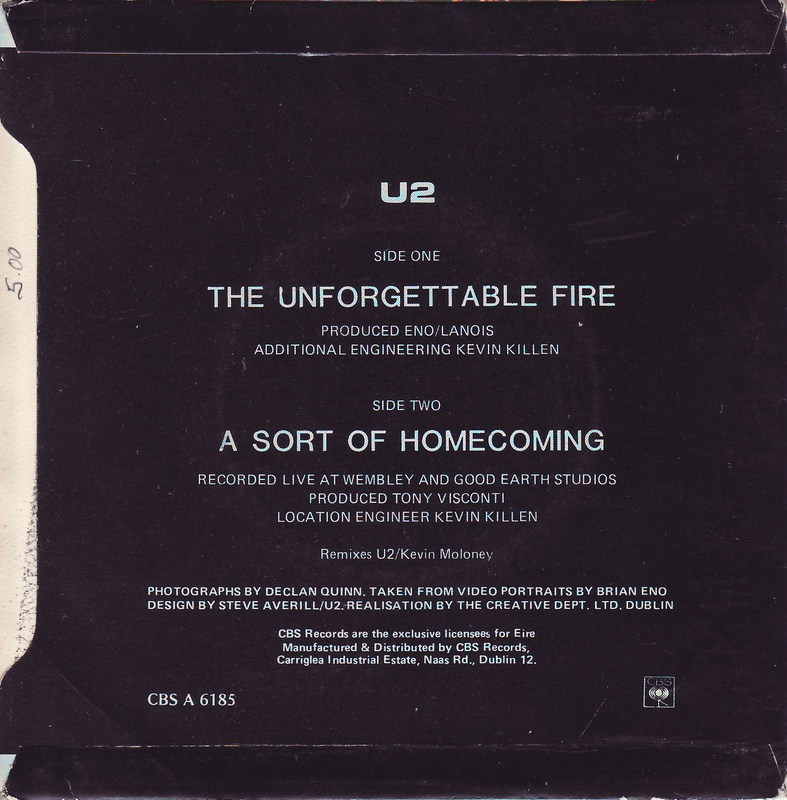 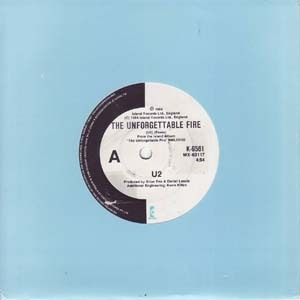 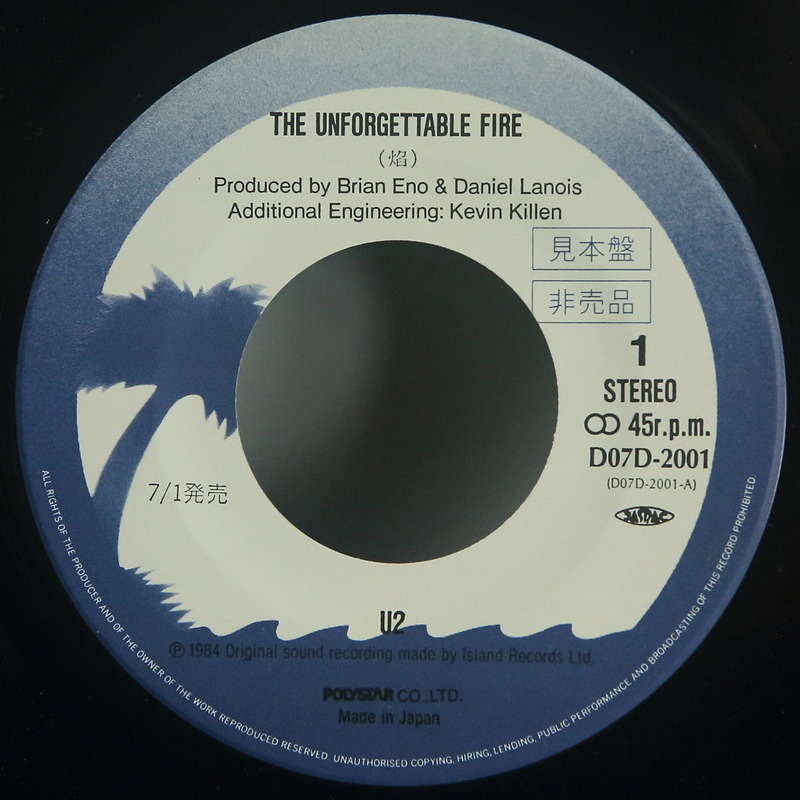 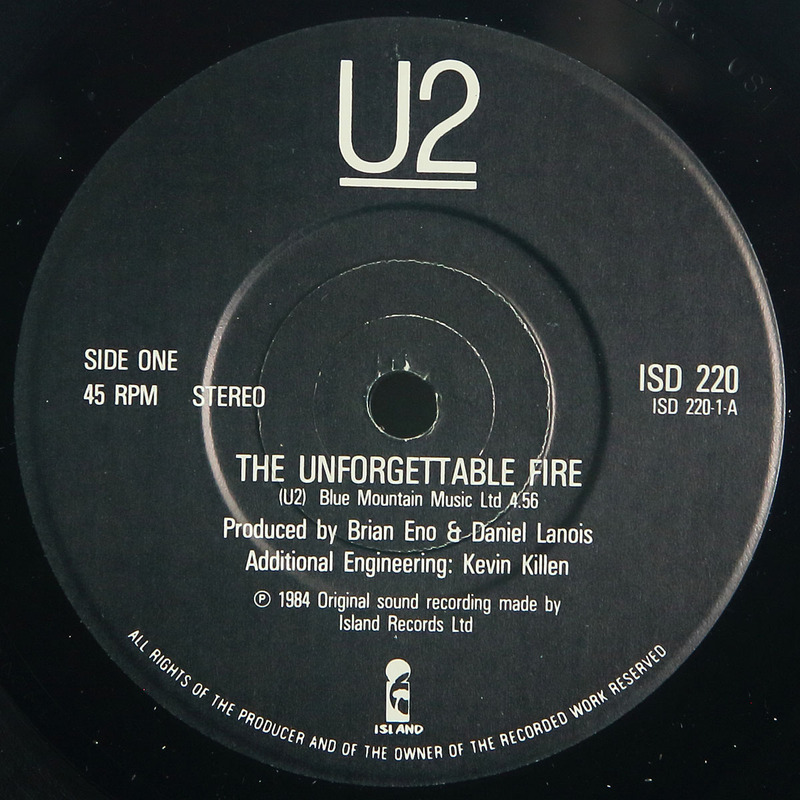 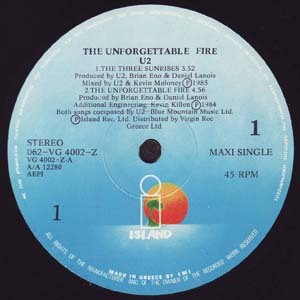 Incorrect spelling in title "UNFORGETABLE FIRE". 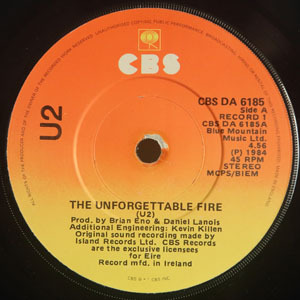 Back PS: Incorrect spelling in title "UNFORGETABLE FIRE". B-Matrix: "6 SMX 65416 P2A2"
Front PS With burgundy & white sticker. 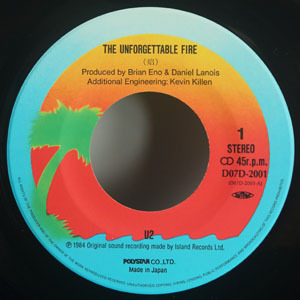 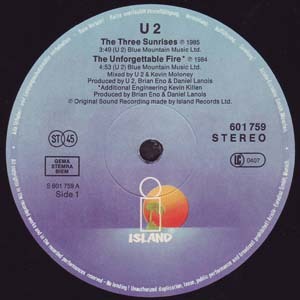 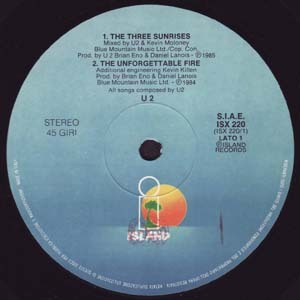 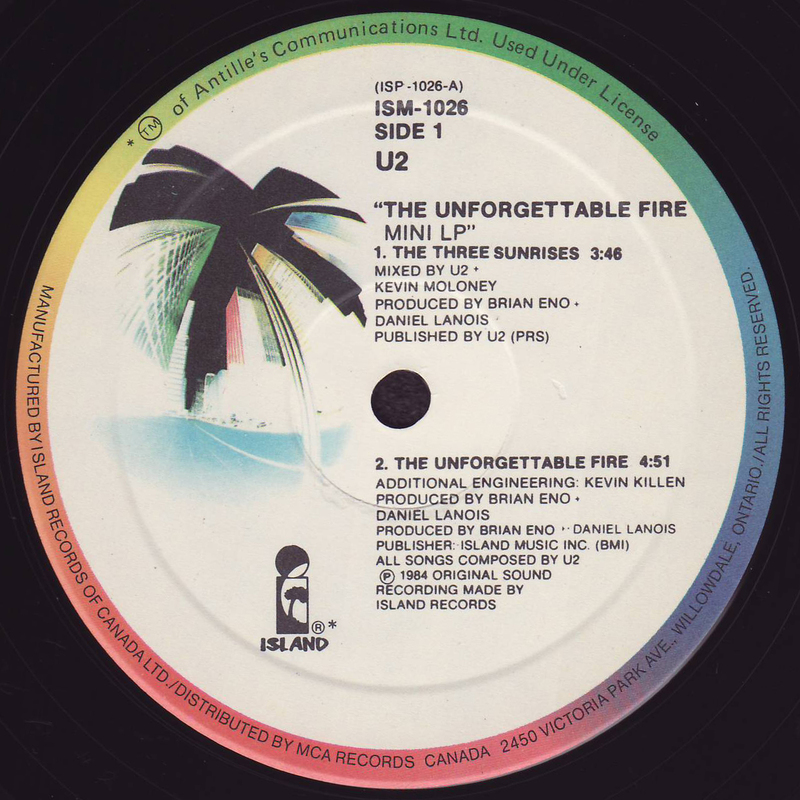 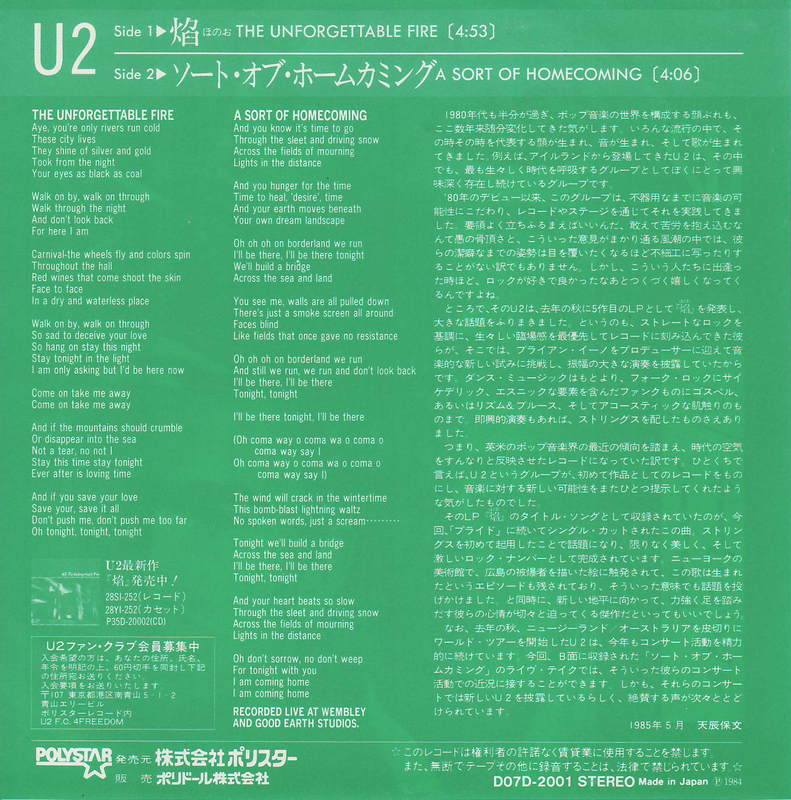 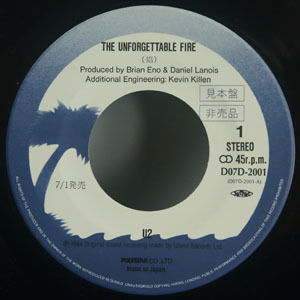 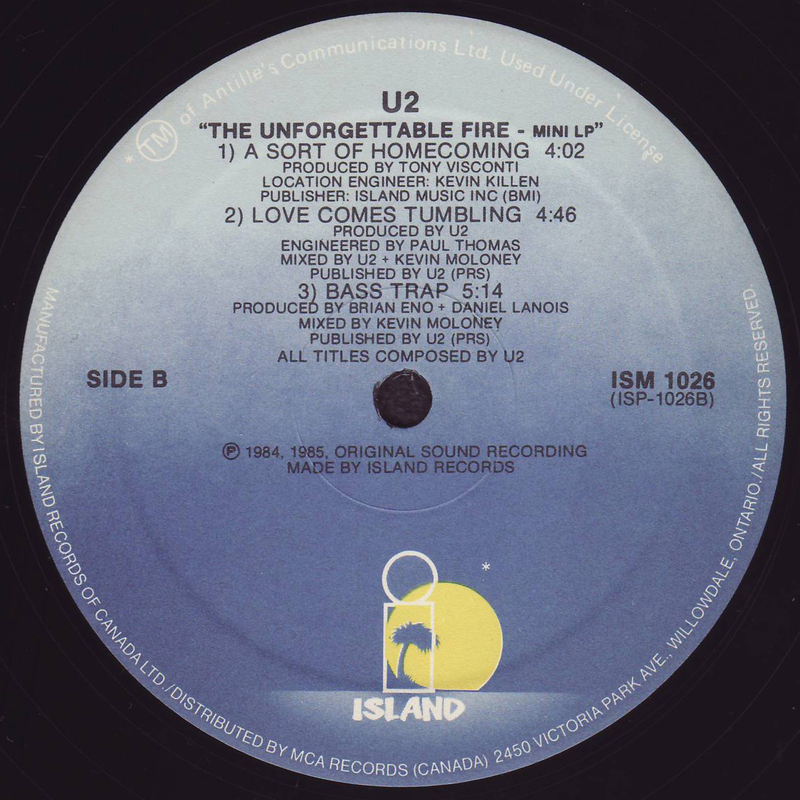 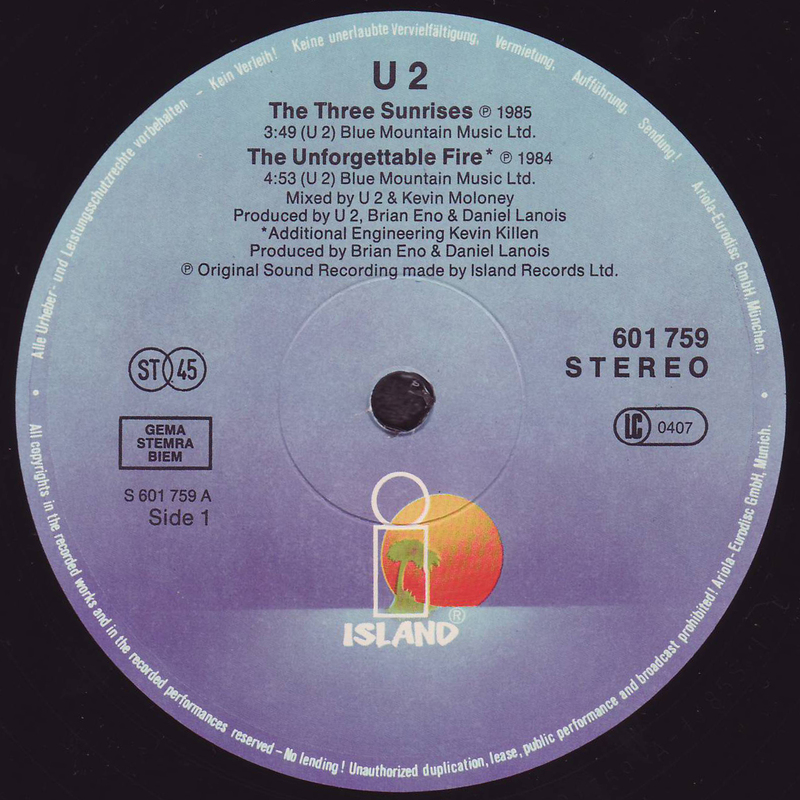 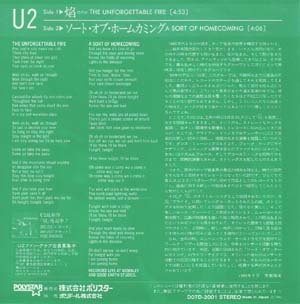 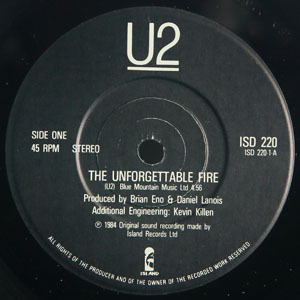 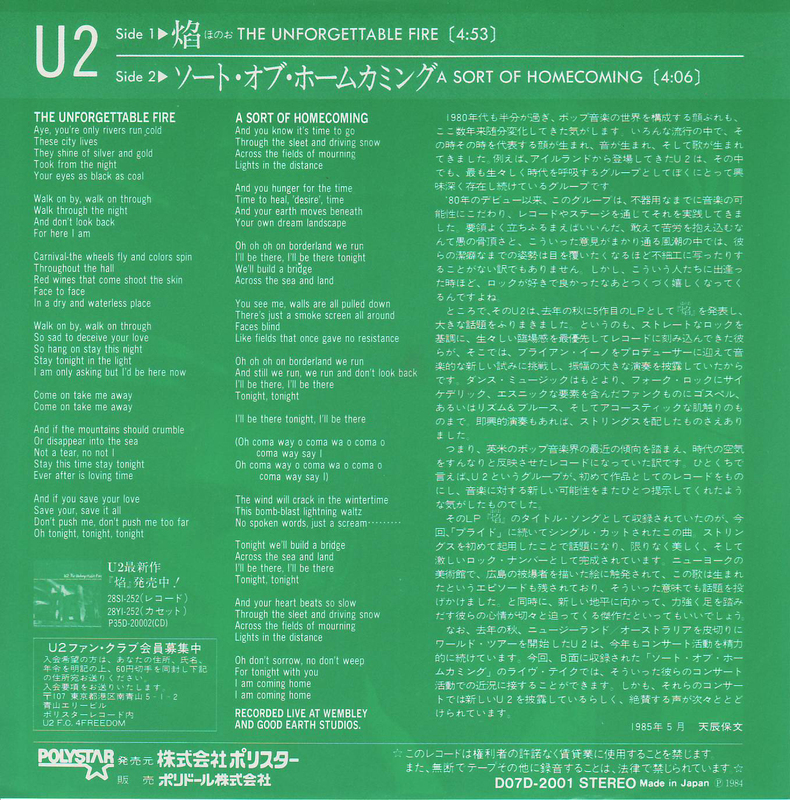 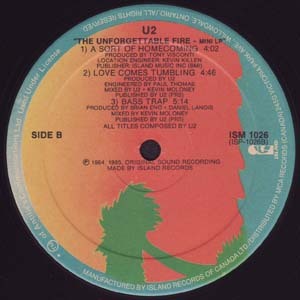 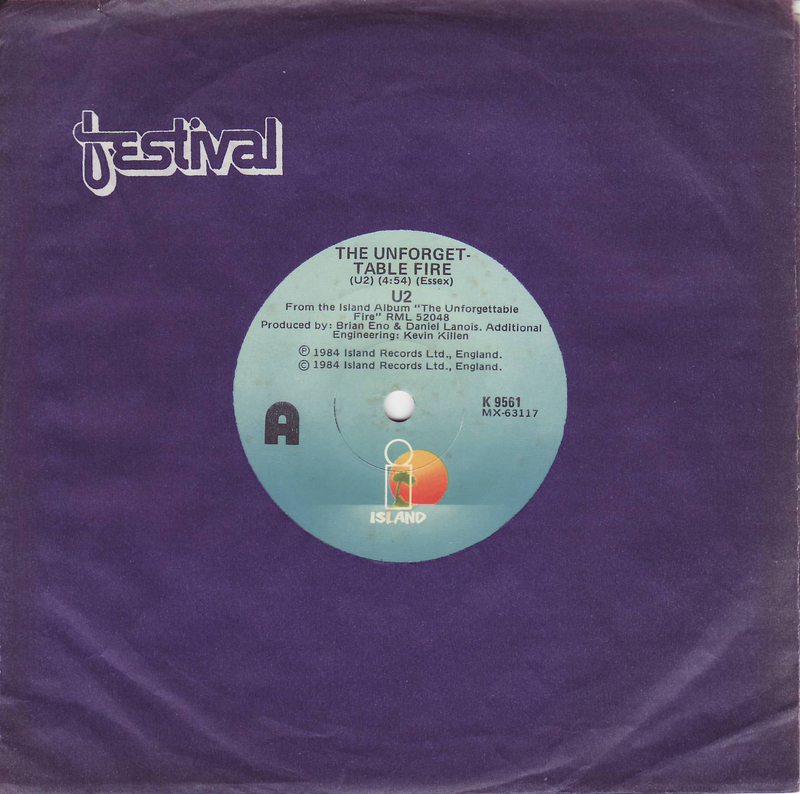 ​Incorrect spelling in title "UNFORGETABLE FIRE". A-Matrix: "19 SMX 65415 P2B2"
B-Matrix: "2 SMX 65416 P2A2"
Front PS With burgundy & white sticker. Correct spelling. 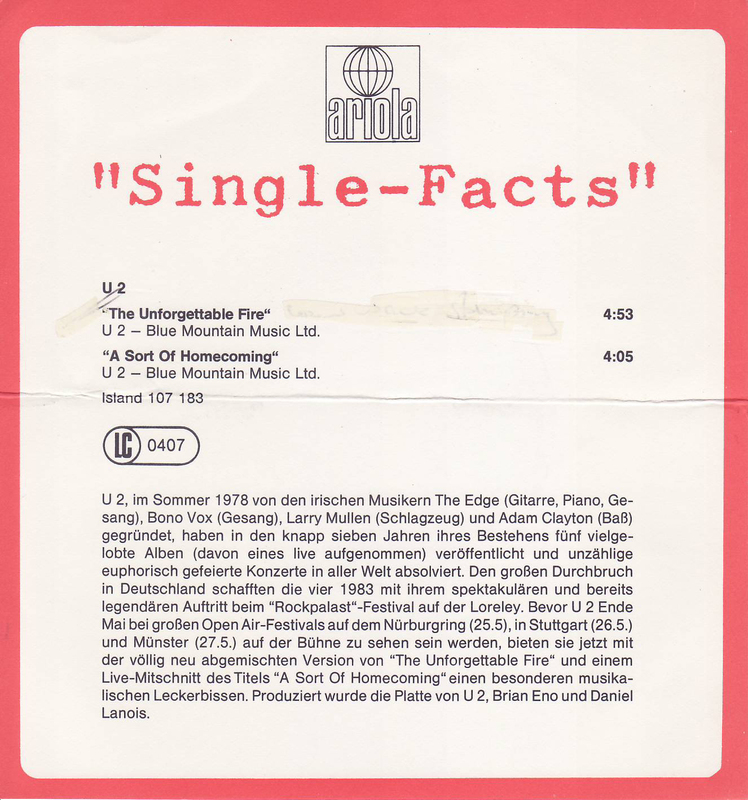 A-Label: Island palm tree with text at 90 degrees. A-Matrix: "ISP 1026-A #2 TLC-A"
B-Label: Island palm tree with text at 90 degrees. 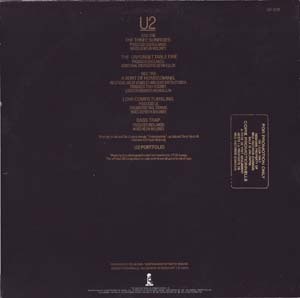 B-Matrix: "ISP 1026-B #2 TLC-A"
A-Matrix: "ISP 1026-A #2 2 TLC-A"
B-Matrix: "ISP 1026-B 3 TLC-A"
Back PS: Gold promo stamp. 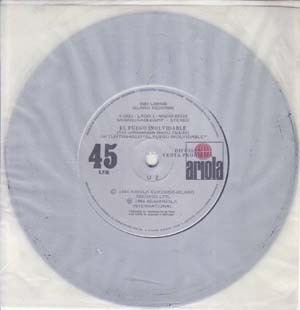 B-Matrix: "ISP 1026-B 2 TLC-A"
Front PS: With "Maxi 45T". Back PS: With "PG122" sticker. 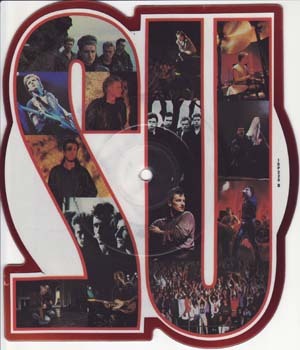 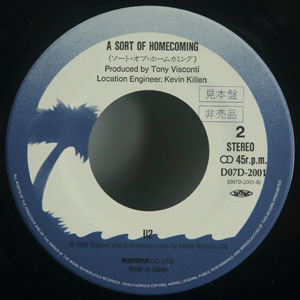 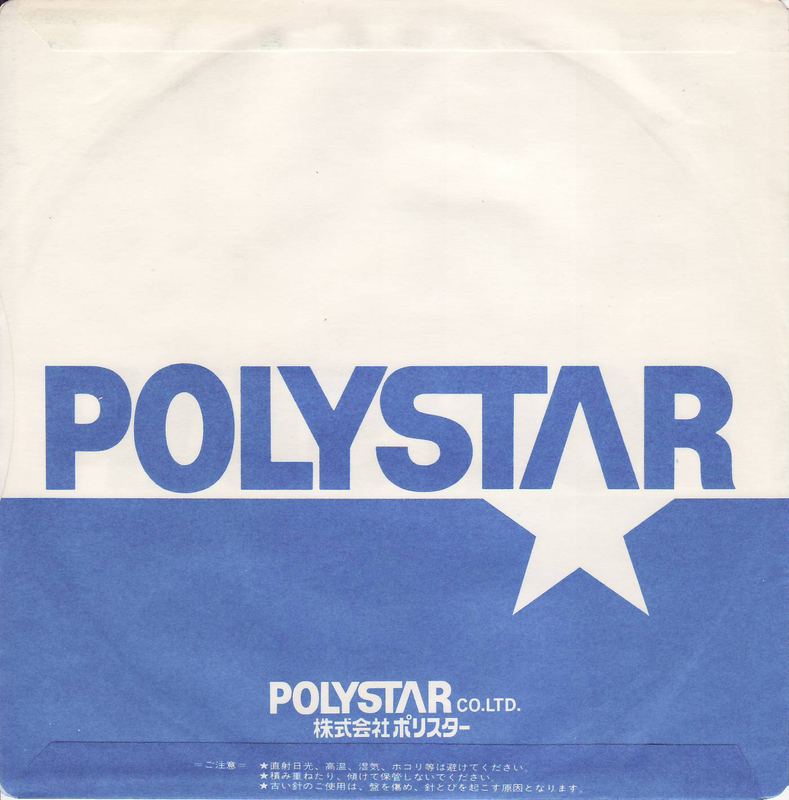 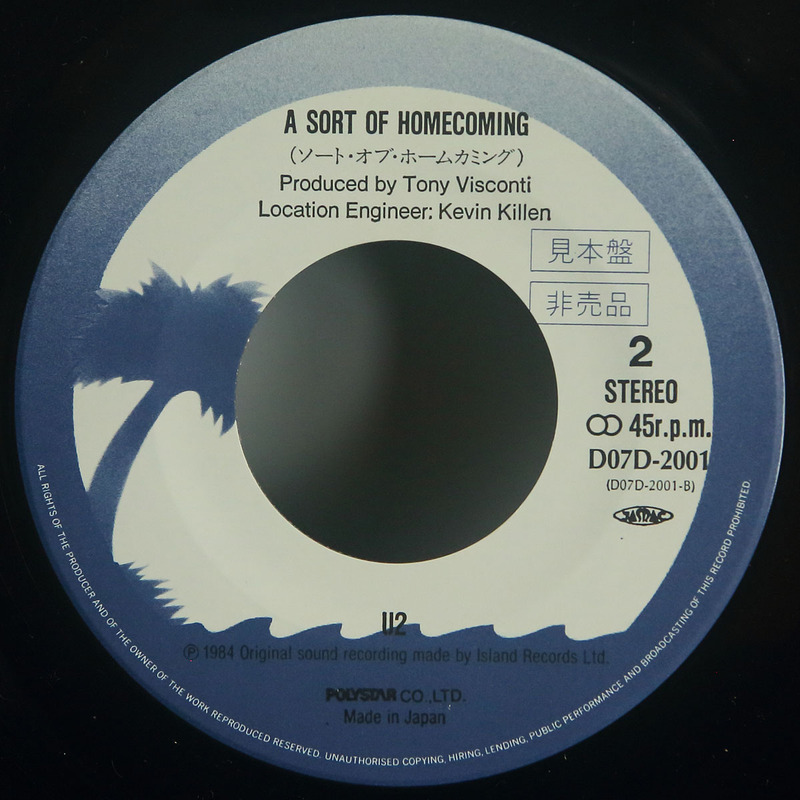 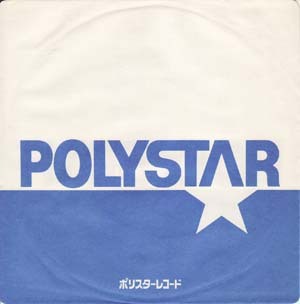 Front PS: With "MAXI-SINGLE 45t". 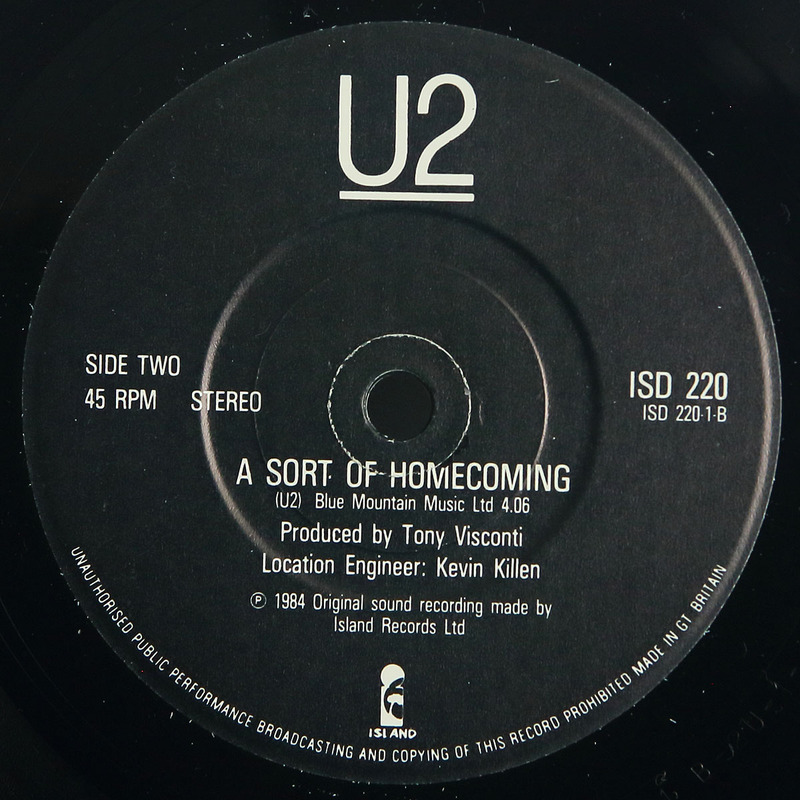 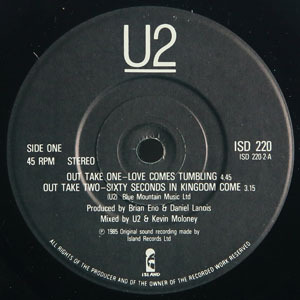 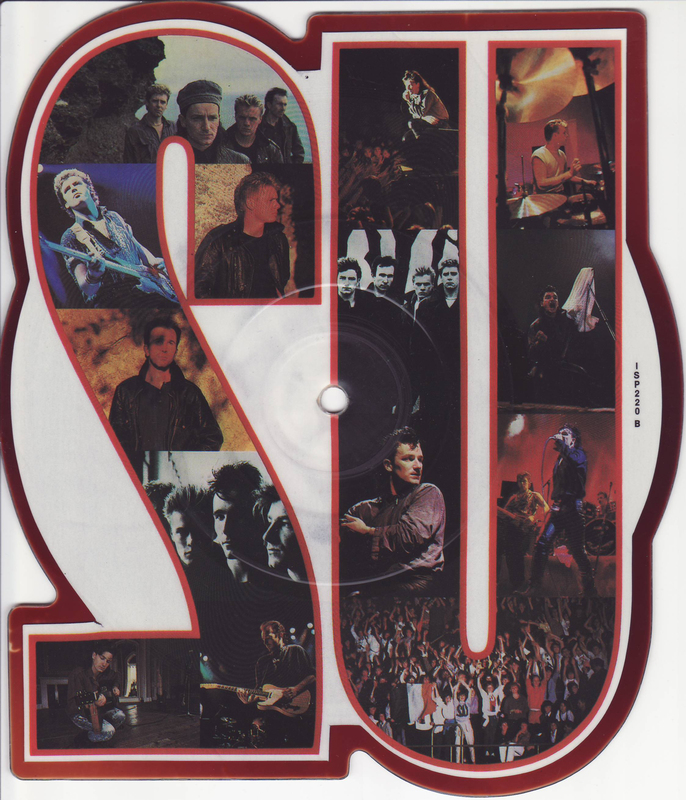 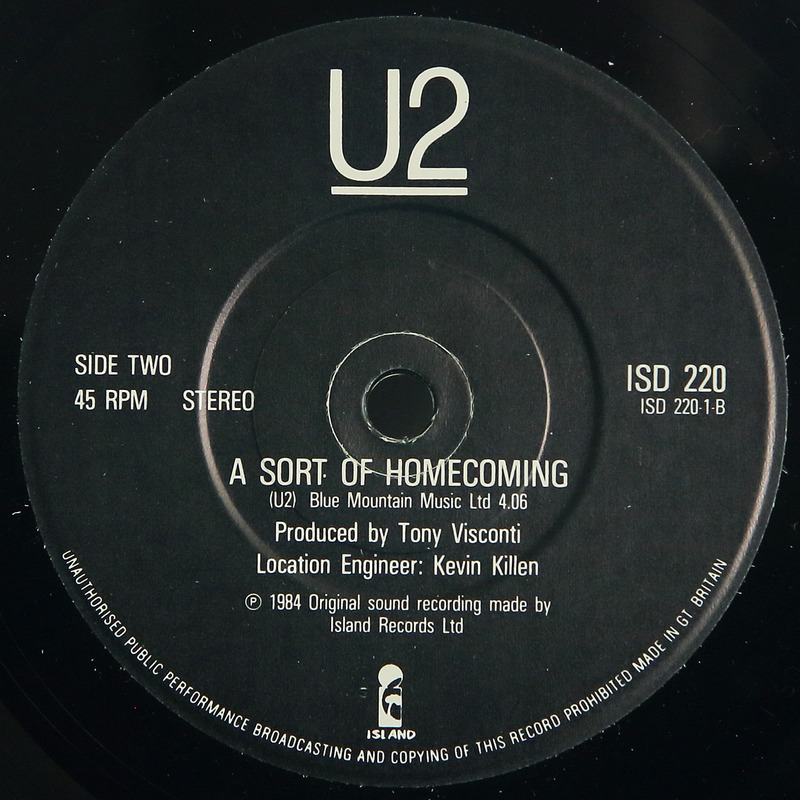 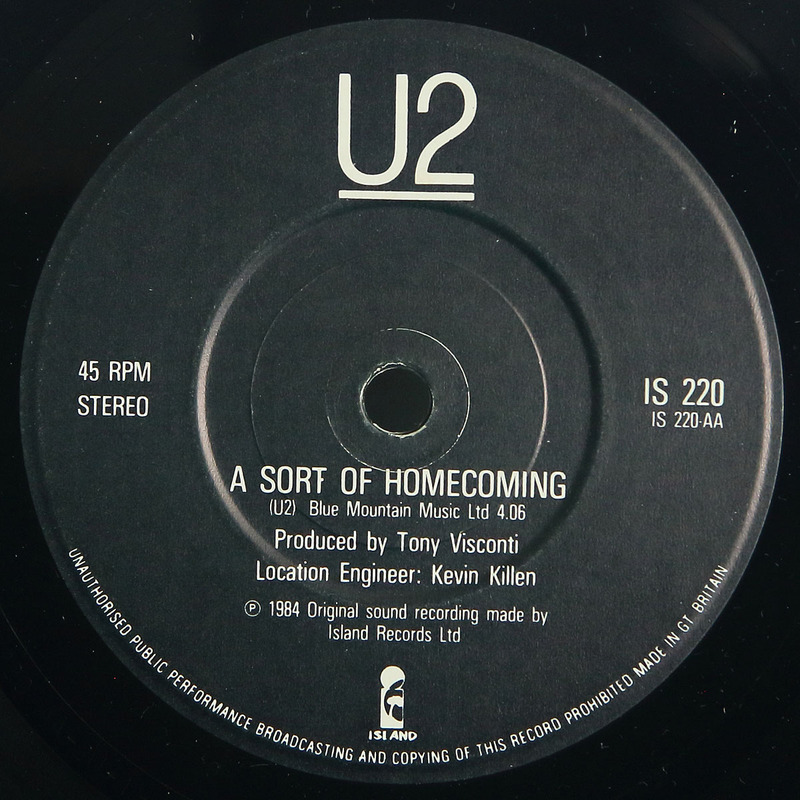 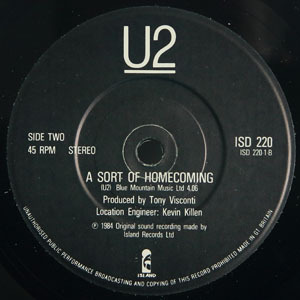 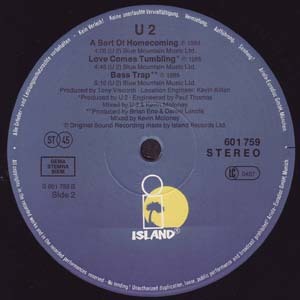 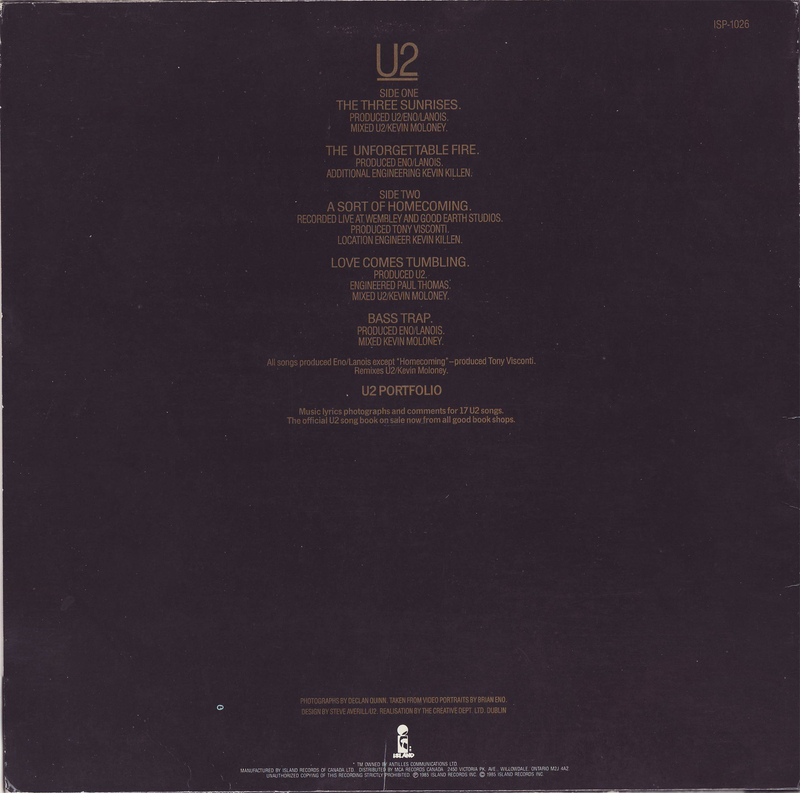 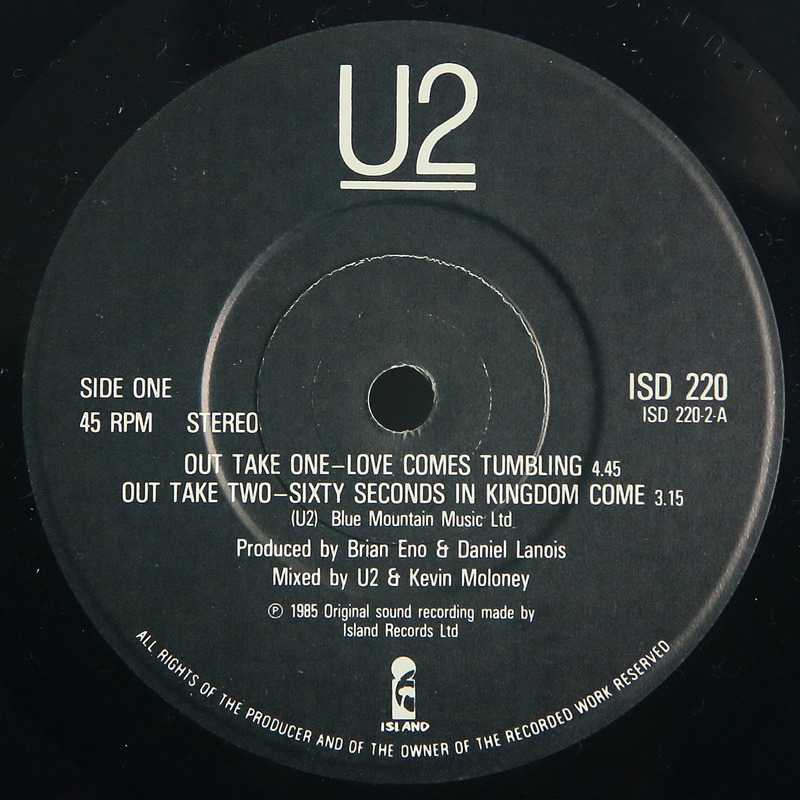 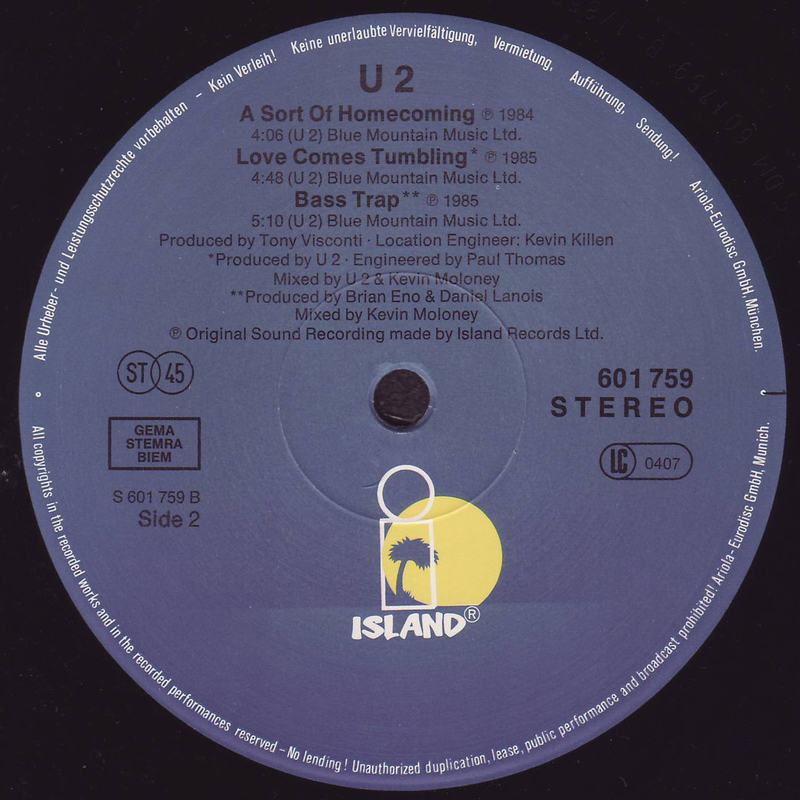 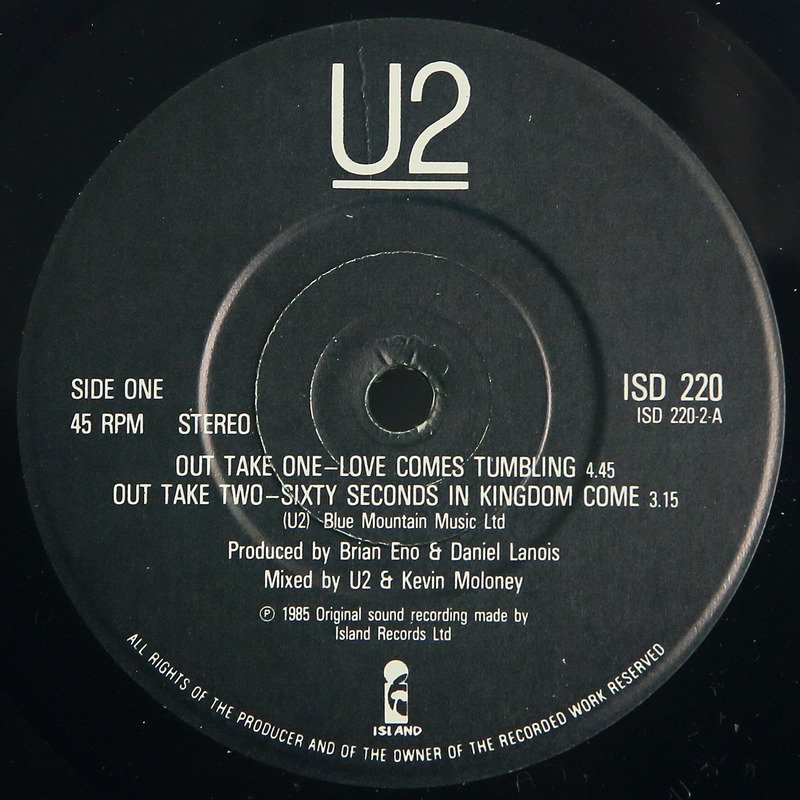 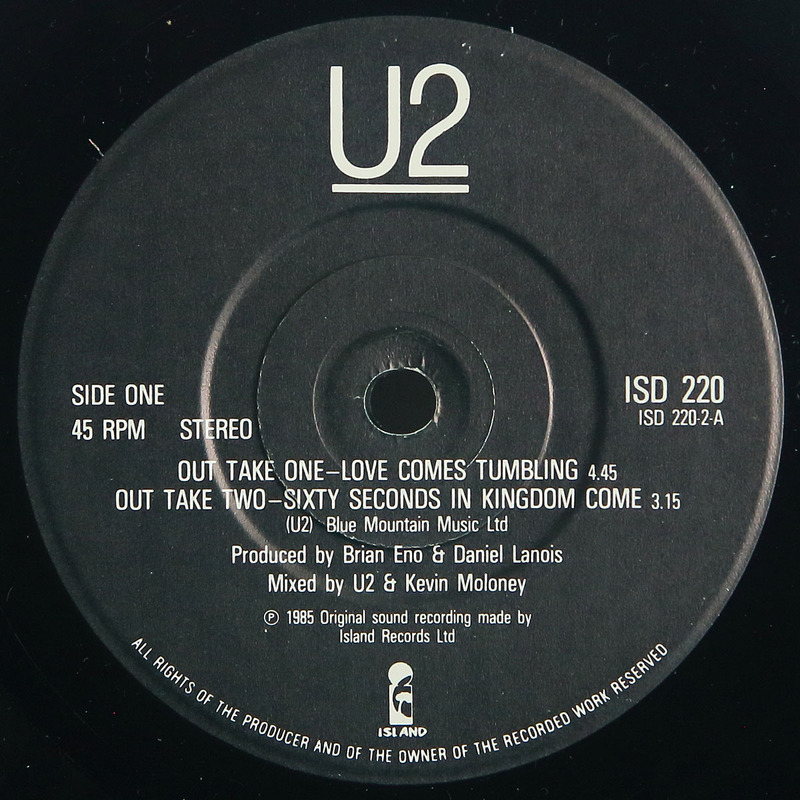 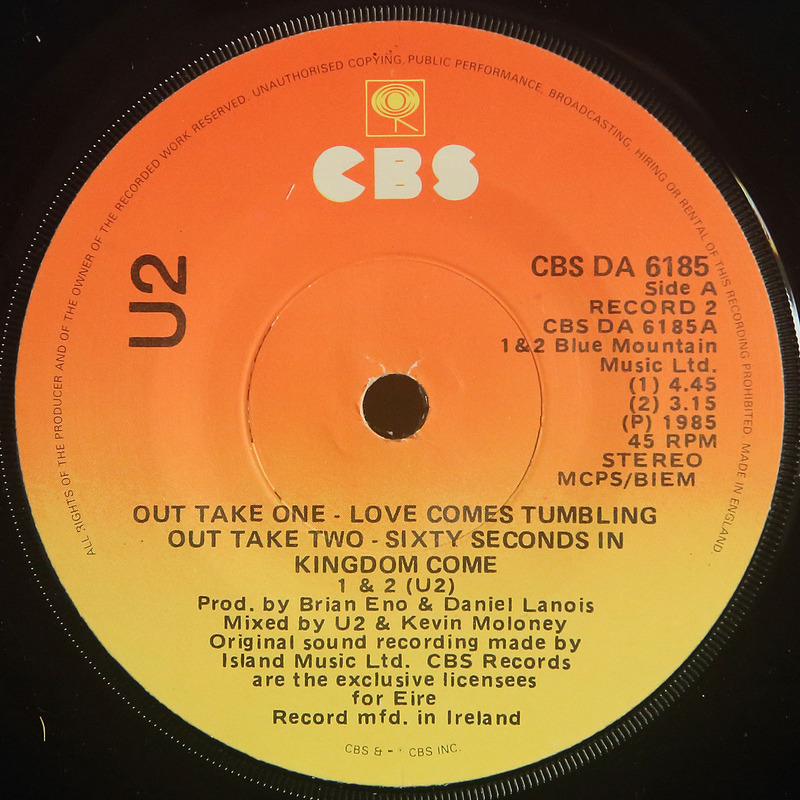 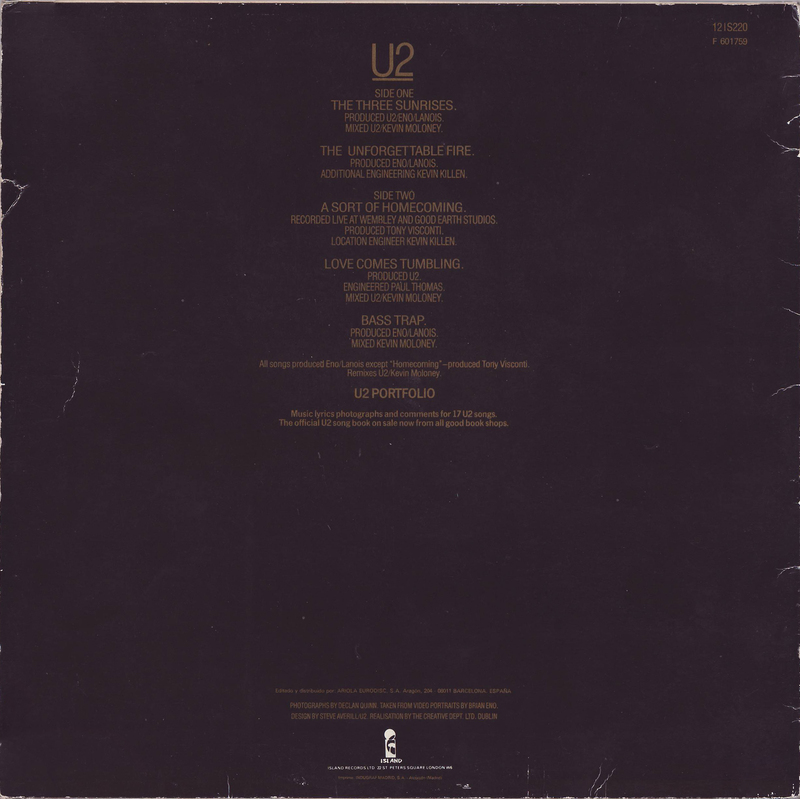 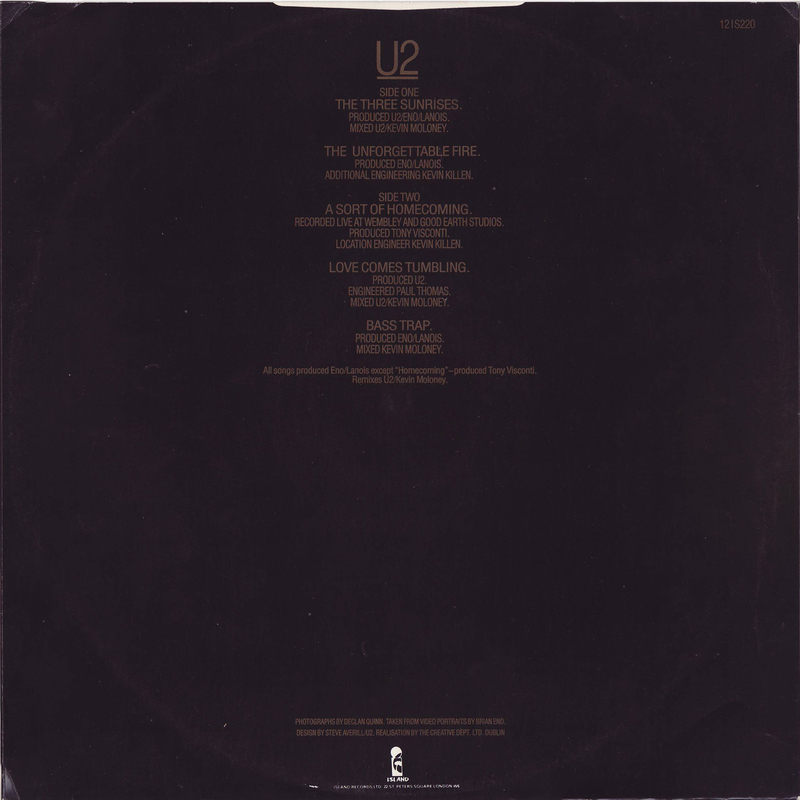 Back PS: UK sleeve, thumbcut at top. B-Matrix: "ISX 220 - 2"
A-Matrix: "L 20046 - A .. SMX 65415 P2B"
B-Matrix: "L 20046 - B ... SMX 65416 P2A"
Back PS: Thumbcut at top. 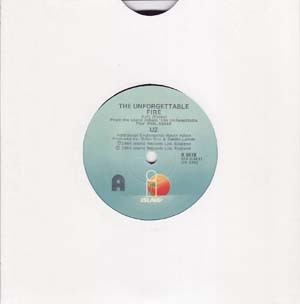 A-Matrix: "MXSI 18003 A 02.07.85 SB"
B-Matrix: "MXSI 18003 B 02 07 85 SB"